I wish to say that I have been overwhelmed and so grateful to all of my readers for their comments and wonderful stories they have shared. Each post retains its own comment section so I suggest you revisit the older posts and enjoy their stories as much as I have. In addition, at times I update the older posts with more information or photos I’ve acquired since being published originally. Some of you have asked to be put on a mailing list. Due to the large number of emails I would have to maintain, I decided to open a Facebook page where I will post notices of new blog articles. Also, you may upload your own photos of Manila to share with others. See the Facebook link on the right hand side of this page. You all have reminded me so much of the beauty of Manila and the graciousness of the Filipino people. Thank you so very much ! As I said in the previous post, my family and I lived in Malate on Remedios street in a side-by-side duplex from the time I was about 7, around 1952. I was the typical young lad in bare feet and shorts running around the neighborhood playing marbles with my friends and patronizing our local sari-sari store at the corner of Remedios and Dakota (Adriatica). I loved that neighborhood. The owners of the duplex, the Tamayo family, lived next door. Their children Tina and Marco were my best friends. Their dad was a ship’s captain who would frequently sail to Cebu. Here’s the “six degrees of separation” story. 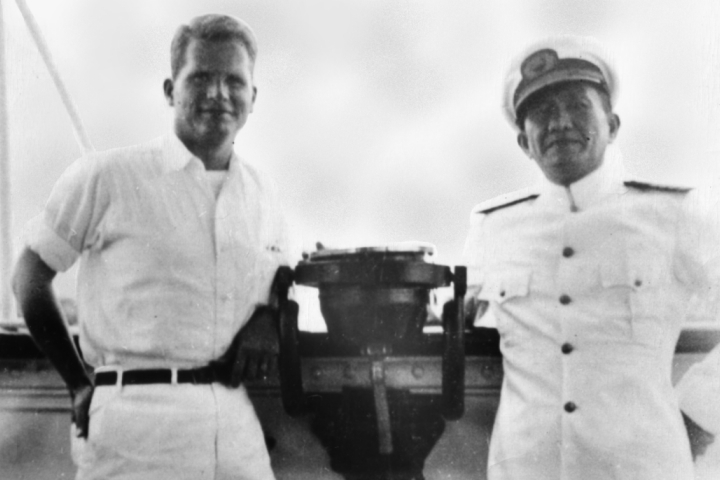 When we were doing interviews for our Santo Tomas documentary in 2004, I talked to Clif Forster, an internee whose dad, Charles Forster was the head of the American Red Cross in the Philippines before the war. When the Japanese started bombing Manila in December 1941, Clif and a ship’s captain arranged to evacuate the military wounded from Manila to Australia on the ship, Mactan. The ship’s captain was the same Capt. Tamayo that became our landlord 15 years later. Some say there are no coincidences in life. My father used to go to the U.S. to buy jewelry for our store, Gem Gift Shop, on the Escolta. In early 1953, on one of his trips, he brought back a console TV and Hi-Fi set. It was a beautiful piece of furniture that included a turntable and radio. Well, all of us marveled at this new invention ! The only problem was, there still wasn’t any TV being broadcast until a few months after our set had arrived. At least once a day, we’d turn it on and watch the snow. Then in 1953, my mother’s former boss, James Lindenberg, started broadcasting on DZAQ-TV Channel 3 and we would watch “I Love Lucy” and “Father Knows Best”, “Tawag ng Tanghalan” and “Student Canteen”. Many of our neighbors would look in through our windows and watch the shows with us. 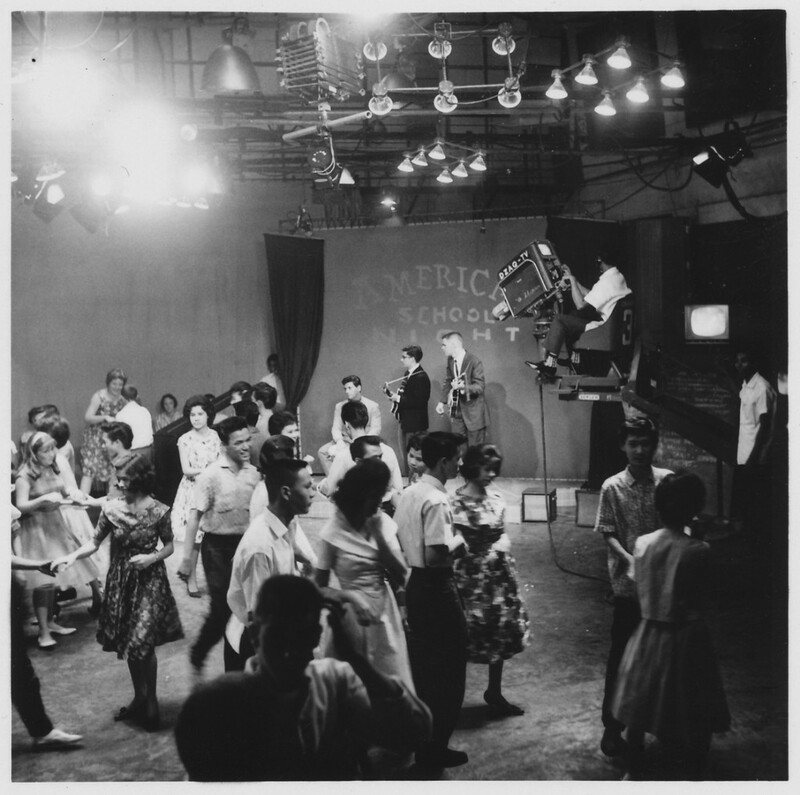 In 1961, Bobby Ng hosted a show on DZAQ similar to American Bandstand that would feature local talent. One evening was called “American School Night” and me and my group comprised of Danny Marquez, Rick Catala, and Bob Franklin were invited to play along with R.J. (Ramon Jacinto) and the Riots. Danny, who played piano, was the most talented in our group. Here’s a photo of our band that included Ronnie Davis (far right) who wasn’t even part of our group but when he saw the picture being taken, he grabbed a guitar and sneaked into the shot. So…another six degree of separation story: 60 years later as I started writing this blog, Bobby’s brother, Larry Ng contacted me and is now helping me write stories for Manila Nostalgia. Small world, indeed ! 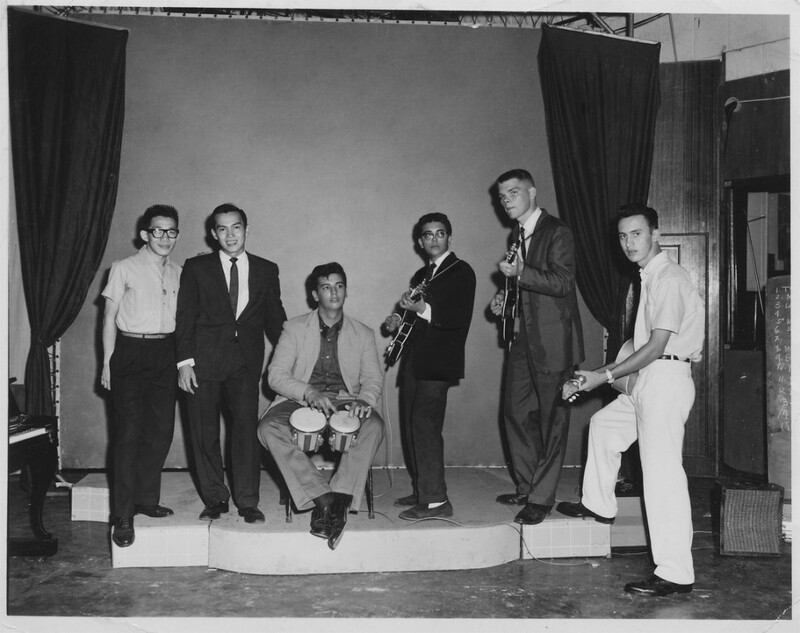 Band Picture (left to right): Bobby Ng, Danny Marquez, Rick Catala, Lou Gopal, Bobby Franklin – and sneaky Ronnie Davis. Anyway, when I went back to Manila in 2004 absence of about 40 years, I felt the need to revisit my old Malate neighborhood just for old times’ sake. Of course it had changed but overall, it was still recognizable. Together with my wife and friends, Judy and Skip Haven, we hunted down the old duplex … and found it ! Or at least, half of it. The landlord’s half was there but the half we lived in was turned into a crab restaurant. The irony ? I don’t like crab. It’s hard to imagine Manila without our famous boulevard. 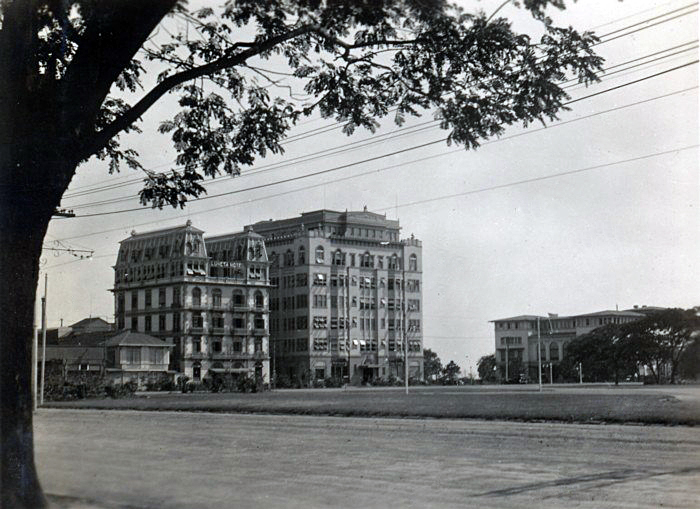 Until 1941, Dewey Boulevard went from the Luneta south to Cortabitarte, passed the hotels, clubs and apartments, the American High Commissioner’s office, the Plaza Militar, large residences of corporate executives and the rich and famous, and included the famous Manila Polo Club entering from F.B. Harrison and opened up to a large, grassy field that included the horse stables (see photo below). Dewey was also used as an airstrip by both the Japanese and U.S. forces and then extended up towards Baclaran during the Fifties. The boulevard concept was conceived by Daniel Burnham as he was charged to design a plan to beautify and update Manila from the restrictive and old fashioned style of the Spanish colonial period. He envisioned wide-open spaces with palms and quick-growing acacias lining the sidewalks; something on the order of other cosmopolitan cities such as Buenos Aires or Paris. The original design was to build the boulevard on reclaimed land to about as far south as the Old Fort San Antonio Abad in Malate with a possible extension all the way to Cavite. 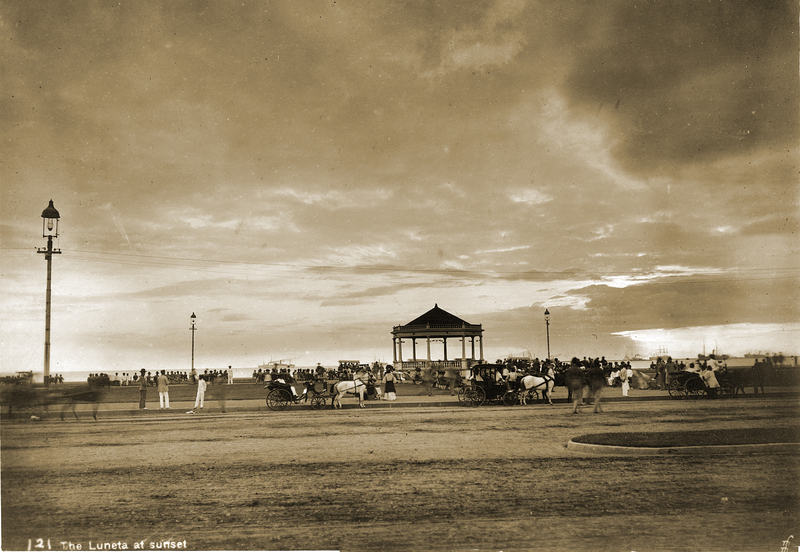 Dewey Boulevard became the showpiece of Manila, not only to present the fabulous Manila sunsets but it was also famous at night for its nightclubs and casinos. 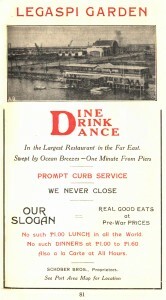 Many a late night was spent at the Nile, Bayside, Viceroy, D’Wave, El Mundo and La Playa. Apparently considering this was to be a father and son night, my dad took me to a casino (I don’t recall the name) on Dewey, handed me a roll of coins and let me play the slots while he engaged in more serious pursuits at the dice table. I was about 12 years old. Rizal Park’s history began in 1820 when the Paseo de Luneta was completed just south of the walls of Manila on a marshy patch of land next to the beach during the Spanish rule. Prior to the park, the marshy land was the location of a small town called Nuevo Barrio (New Town or Bagumbayan in Tagalog) that dates back to 1601; it was cleared during the short British rule in 1762 to prevent sneak attacks from the patriotic natives. 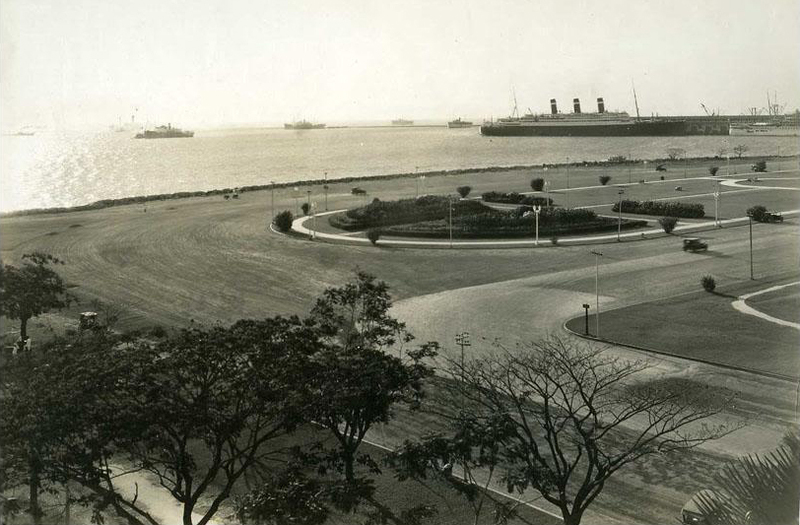 The area later became known as Bagumbayan Field where the Cuartel la Luneta (Luneta Barracks), a Spanish Military Hospital (which was destroyed by one of the earthquakes of Manila), and a moat-surrounded outwork of the walled city of Manila, known as the Luneta (lunette) because of its crescent shape. 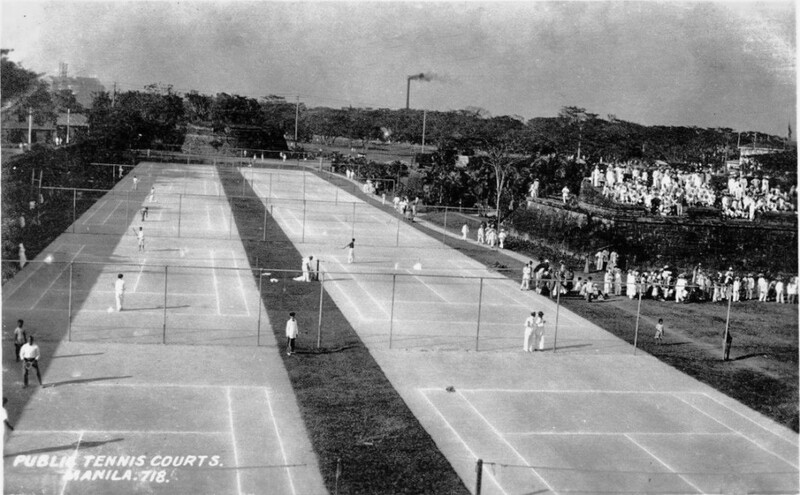 “There is a tennis club inside the park in the area also known as Bagumbayan, the place where the Spanish colonialists executed Filipino rebels, the most famous being Jose Rizal. Reaching the corner we could go left onto the west boundary of Wallace Field along the unfinished extension of Calle M. H. del Pilar. This is the Ermita district of Spanish residents. Arriving at Calle San Luis if we looked to the right we would see the Luneta Hotel. It had a small boat landing on the bay for the U.S. Fleet to disembark upon. Sailors, soldiers and marines landed on that small platform and walked through the middle of the restaurant and garden complex that boasted the best tenderloin steaks and seafood in the Far East. Within the interior on the right, displayed the longest bar in the Orient and to the left, the restaurant. Upstairs was the massive dance floor and very obvious small cubicles where some clients would enjoy the seedier entertainment of night life. The photo below is rather interesting. 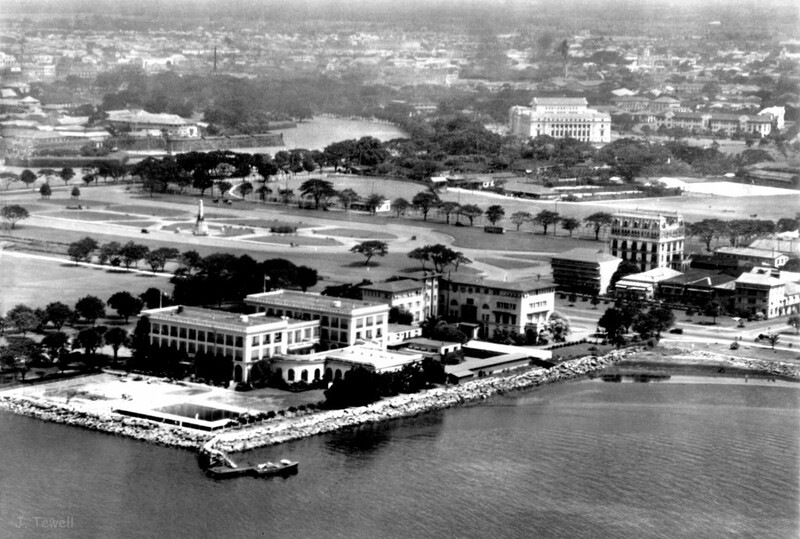 It shows the Army Navy Club, Elks Club and the Luneta Hotel however the University Club apartments had not yet been built. I’m guessing this was taken in the late 1920s. 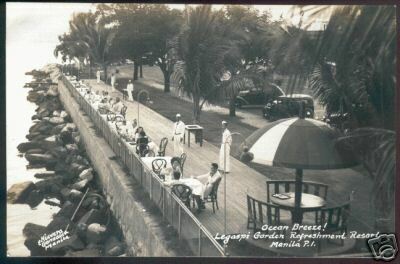 Note that the area to the right of the breakwater was later filled in and taken over by the American Embassy property. The hotel has an exceptional Belle Epoque facade reminiscent of French renaissance architecture. Designed by Spanish architect Salvador Farre, it was completed in 1918 on 38 San Luis (T.M. Kalaw) street during a more genteel era as Manila emerged from Spanish colonialism. The tenants had a gorgeous view of the famous Manila Bay sunsets and Bagumbayan (Luneta Park) from its functional balconies, perhaps savoring coffee with their meriendas. 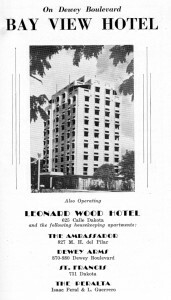 According to one U.S. Army doctor who stayed at the Luneta Hotel before war broke out, “The hotel was very old, and hardly luxurious by American standards. There was a bath on every floor which at times was taxed to serve several men at once. Fortunately, all the occupants of the Luneta were men, so we did not stand on ceremony as we entered and left the bath. My floor, the seventh, had a bath with four showers, five basins, and five commodes.” from Parade of the Dead, John R. Bumgarner, M.D. Luneta Hotel Ante-chamber of a suite. 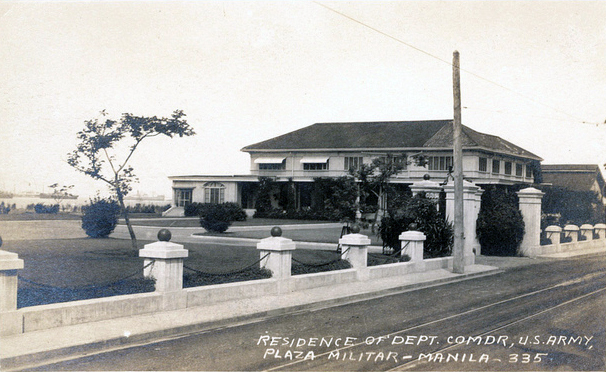 In July, 1941, the army decided to convert the Luneta Hotel into a non-commissioned officers’ club. 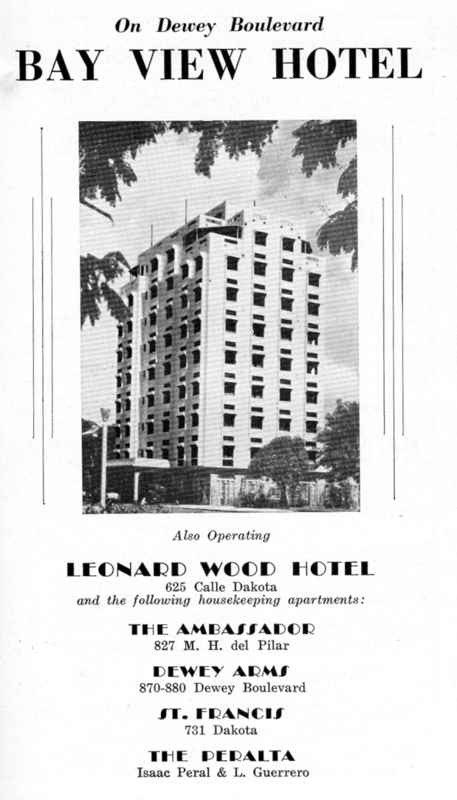 The following description appears to describe the hotel after renovations after the war: “The hotel was described as a quietly elegant and attractive family style hotel with a charmingly continental design. It used to boast of 60 rooms with private bath, two suites, telephone in all rooms, a restaurant, coffee shop and spacious lanais. It is the only building in Manila in the French Renaissance style. If you are observant, you will espy the whimsical gargoyles in the form of lions, crocodiles, griffins and other mythical creature as decorative supports of its balconies. The balconies themselves have delicate filigreed railings that add a touch of lightness to the solid concrete façade. The French-style mansard roof, the full length and dormer arch windows, the classical ornamentation gives a distinction and elegance sorely lacking in Manila today.” Methods and Strategies in the Rehabilitation of the Luneta Hotel, John Joseph T. Fernandez, MSArch. 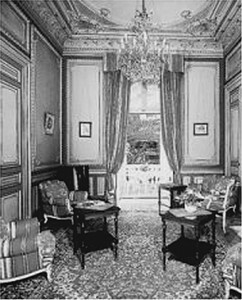 Other than the above photo, I’ve been unable to find any other pictures of the interior of the hotel. Perhaps one of my readers may offer something tangible. The Luneta Hotel has been restored by the Beaumont Holding group and designated as a National Historical landmark. Their website advertises that it is soon to open but alas, even the website doesn’t work. The neighboring high-rise was known as the University Club Apartments and was built some time pre-war. I can’t seem to find when it was built but I’m guessing in the early 1930s. It housed many American families and servicemen. It suffered some damage during the war but was restored and later became the Shelbourne Arms and then the Hotel Otani and finally demolished in the 1990s. Next door to the stylish art-deco Metropolitan Theater once stood a finely kept park of about 10 acres. Originally created as a botanical garden by Governor Norzagary in September 1858, it was named for John Mehan, an American officer who played a significant role in the system of Manila’s city parks. 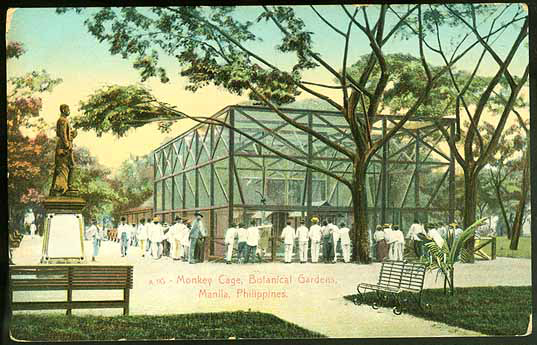 It contained a large variety of trees and plants as well as a small zoo. The photo below was taken in 1945 showing war damage to the Metropolitan Theater however it clearly shows the wooded area behind it which is where the Mehan Gardens was located. Laid in crushed coral, glistening white paths meander through the garden. You could see young lovers strolling hand in hand under the shady trees. 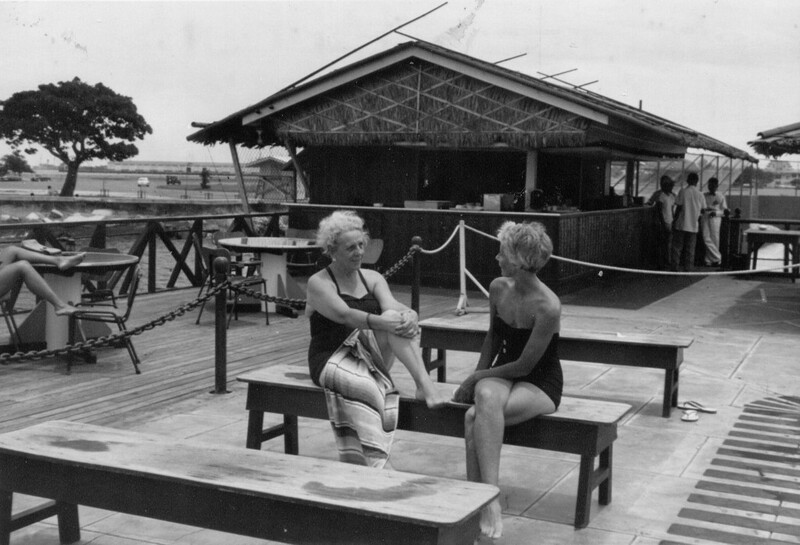 Wooden park benches were spaced at regular intervals throughout. The ten-acre garden was bounded on the north by Calle Colgante, on the east by Arroceros Street, on the south by Concepcion and on the west by Calle Padre Burgos. The section of Padre Burgos that borders the park merged into Taft Avenue. 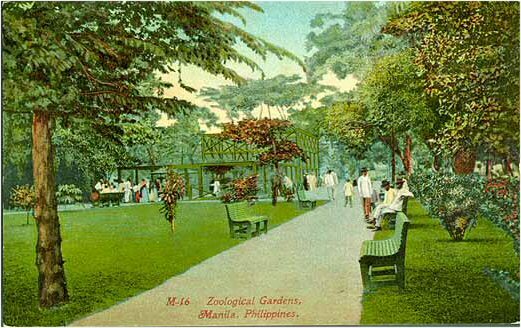 Unfortunately, most of the animals were eaten by the starving population during the end of the Japanese occupation and the park itself was destroyed during the Battle of Manila. 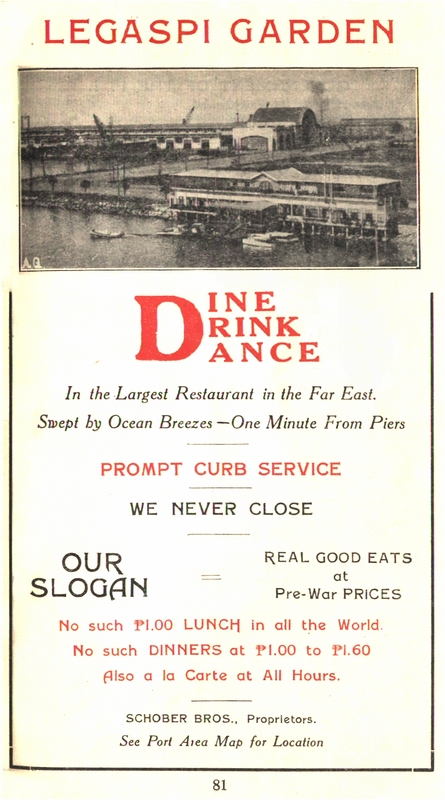 The Bay View Hotel, has been standing since 1909 albeit not then known for its cuisine or comfort until Dr. Kneedler took over ownership around 1934. It still stands at the corner of Isaac Peral (UN Avenue) and Dewey Boulevard. My family used to have a small branch of our jewelry store in the lobby. The taller building on the far left is the Peralta Apartments. “Dr. 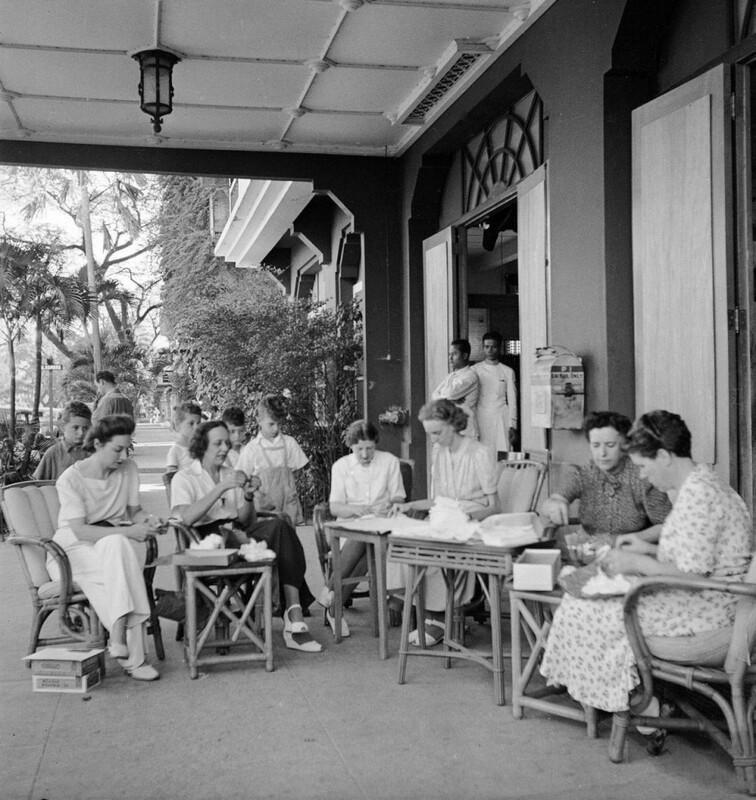 Kneedler’s Bay View Hotel, newly (re)opened, offered the “first real cocktail lounge” with whiskey sodas at 55 cents and Martinis at 60 cents.” (The Manila Americans, Lewis Gleeck) It was the first real competition to the government-owned, Manila Hotel. 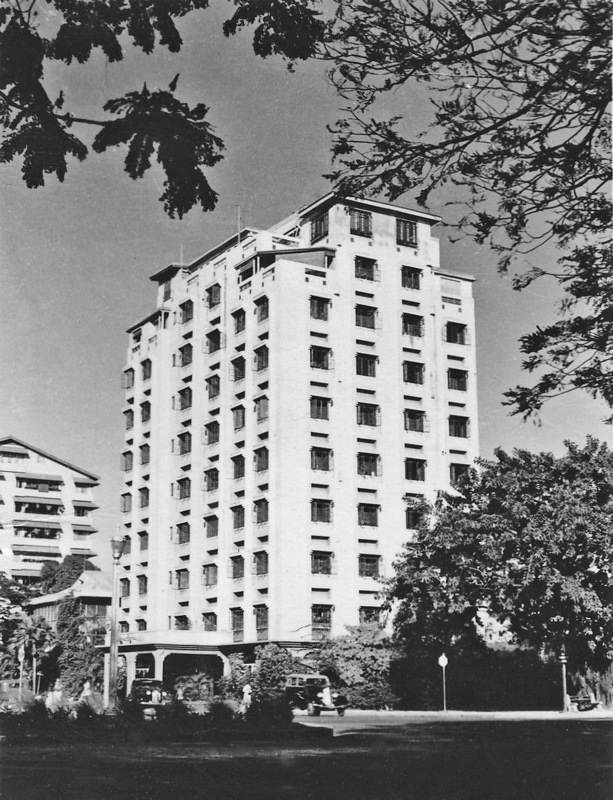 One of the prime examples of the postwar modernity in Philippine architectural styles, the Hilton was designed by architects Carolos Arguelles and Welton Becket who had also designed the Beverly Hilton Hotel and numerous other Hiltons, as well as the classical Jai Alai building on Taft Avenue, while the well known architect Arguelles had just completed the Philamlife Building across the street from the Hilton project. Welton Beckett assigned his best interior designer Scollard Maas for the Manila Hilton. When he arrived, Maas was overwhelmed when he discovered that our local designers, contractors, artisans and suppliers were equal to the best in the world. 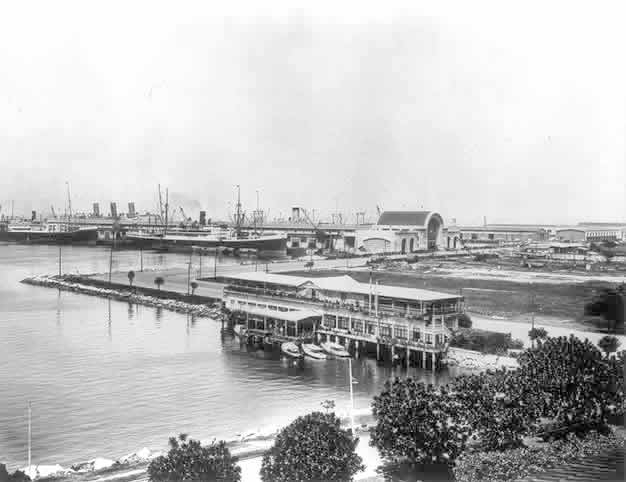 Like Daniel Burnham and countless other visitors who came to Manila, Maas was struck by “the beauty of the city, the tropical atmosphere, the harbor, and most of all the sunsets which were indescribable.” The alignment of the hotel was such that one could view the sunset from almost every room on the western side. The owners of the hotel were the Delgados. 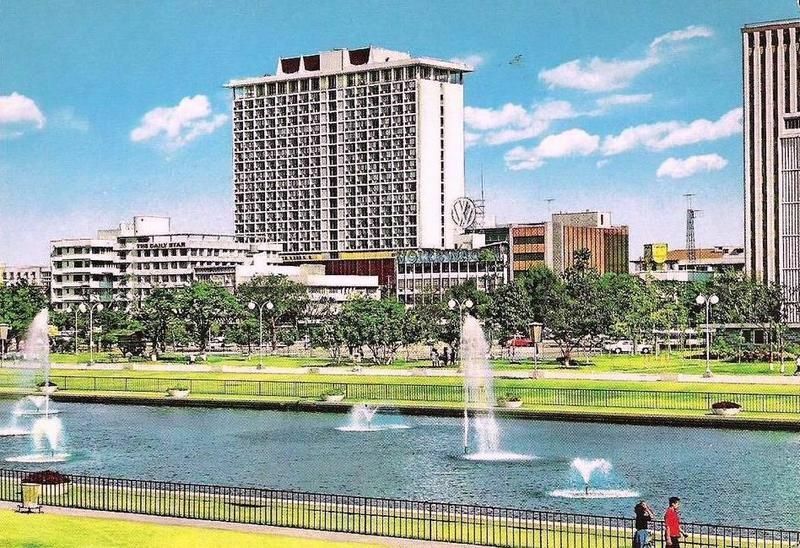 When inaugurated in the 60s, the Manila Hilton became the centerpiece of Manila society. It became the talk of the town, such that there was even a restaurant in the hotel named Talk of the Town. 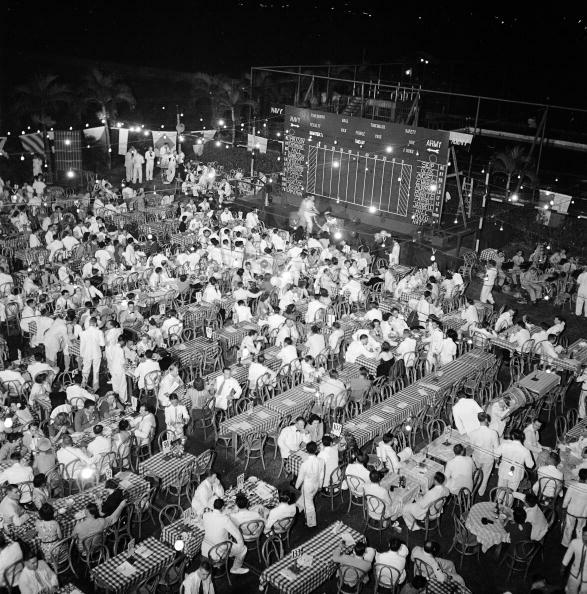 Other establishments were Cafe Coquilla, Port Orient, Rotisserie, Barrio Hilton, and cocktail lounges Sultana, Harana and 1571, but the most famous venue to see and be seen was the Top of the Hilton. One of its cafes even had an aviary where native birds would fly and chirp while you had breakfast. My sister Jane Ng owned and operated the lobby shop that featured native handicrafts and souvenirs. Those were the glory days of the Manila Hilton. On the opposite side of the boulevard are the former Elks Building and the fabled Army and Navy Club where members of the elite hosted parties or watched plays staged by members of the American community. They both had their heyday during pre-war and Fifties eras. The Elks Club now houses the Heritage Conservation Society’s headquarters on the ground floor of the Museo Pambata. 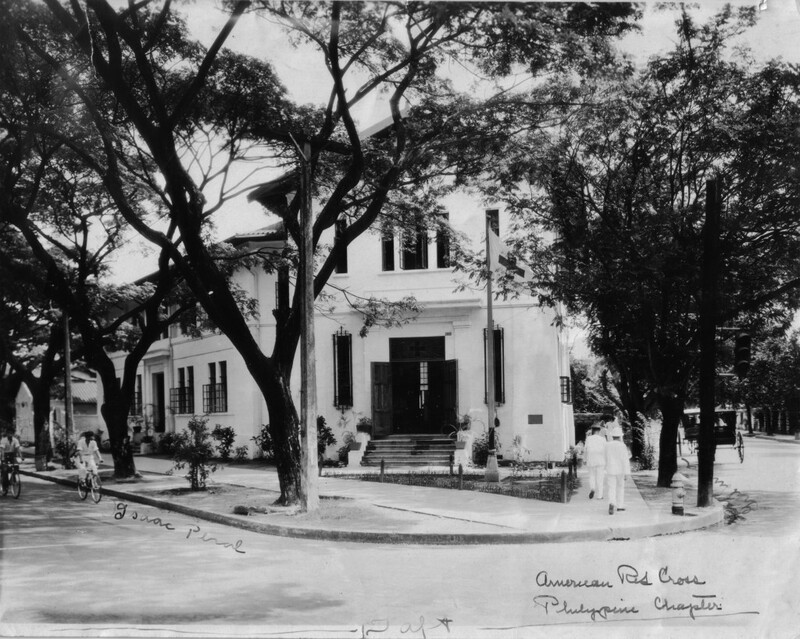 For over seventy-five years, the Army and Navy Club of Manila played an important role in the social life of the city. 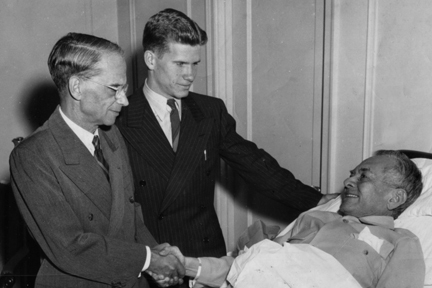 It was the scene of significant events in the history of Philippine-American relations. One of the first clubs established after the American regime, it began its existence inside Intramuros in 1898, then moved twice before entering its location at Luneta Park. 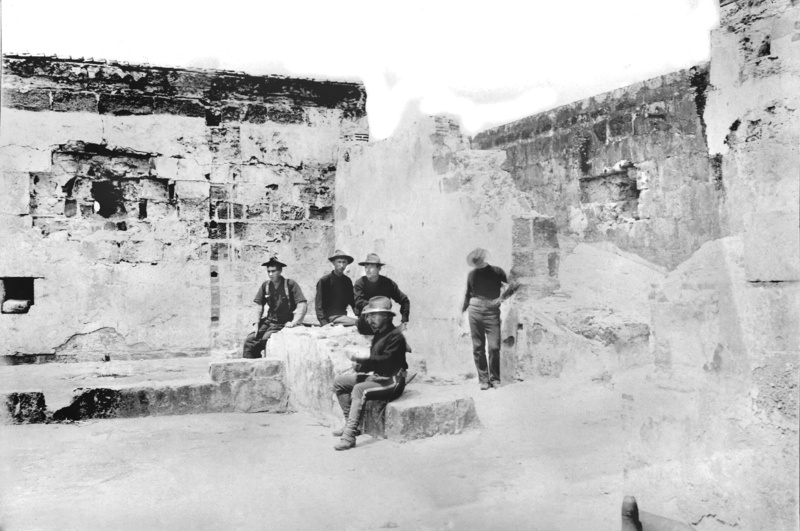 The picture below is from its location occupying the block between Potenciano and Palacio streets, diagonally across from the St. Augustine Church. Aerial view of the dinner held at the Army and Navy Club during the radio broadcast of the anuual Army-Navy football game, Manila, Philippines, November 29, 1941. The photo above submitted by my buddy, Skip Haven, was during a swim meet. You can see the Luneta and the Manila Hotel in the background. My wife and I visited the Army Navy Club in 2004. It was operating as a restaurant. 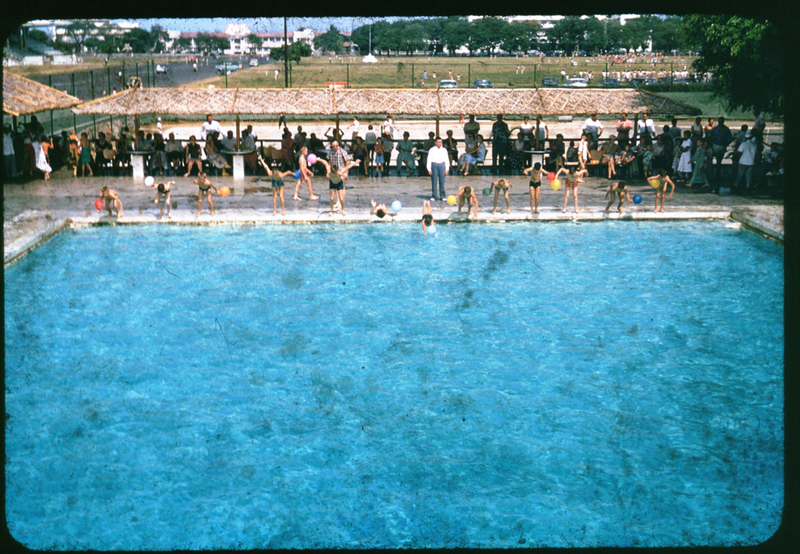 The pool was still being used. The main building seemed to be deserted and in disrepair. Things change. High Commissioner’s Office (American Embassy) was originally the office of the U.S. High Commissioner during the period of the Commonwealth from 1935 to 1942. “On April 1, 1937, the U.S. High Commissioner, Paul McNutt, arrived in Manila with his wife and sixteen year old daughter. Since the relinquishment of Malacañang to President Quezon, there was no official residence for the High Commissioner, so McNutt moved into El Nido, the sumptuous Dewey Boulevard residence of Attorney E.A. 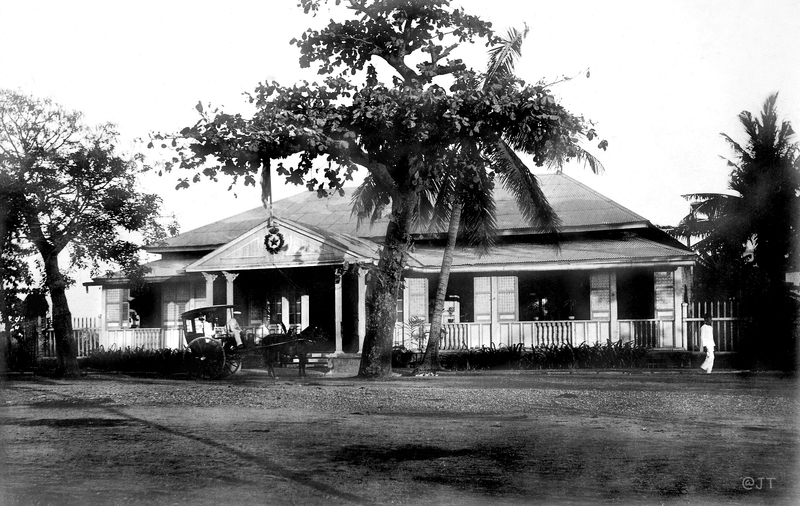 Perkins, which had been the setting for the tragic domestic quarrels of the Perkins family a few years earlier.” Source: The Manila Americans, Lewis Gleeck, Jr. The High Commissioner finally got a home of his own in 1940. 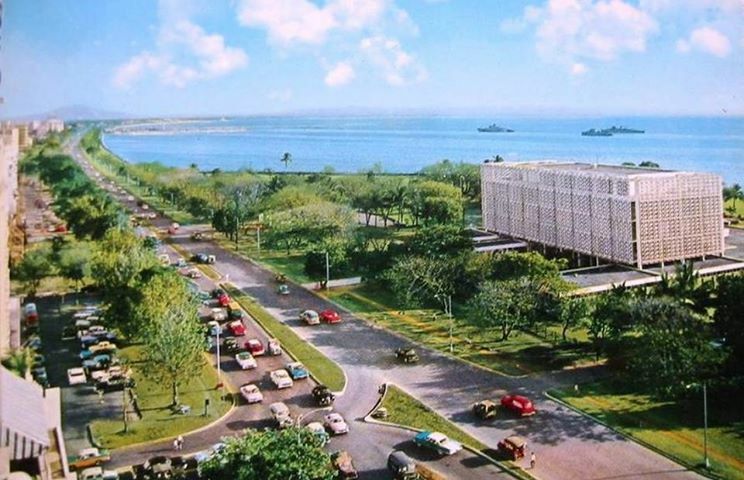 Designed by architect Juan M. Arellano, it was built on reclaimed land next door to the Army and Navy Club, which had been donated by the Commonwealth Government. It was a rather severe and solid structure in modified colonial style that squatted between the seafront Dewey Boulevard and the Bay. Those seeing it for the first time in the Fifties and Sixties could not imagine how stark and ugly the side facing the Boulevard looked. Whatever its esthetic quality, the High Commissioner had a house to live in – for a year and a half. The Japanese would then enjoy its borrowed luxury for three more years before General Yamashita would be tried and condemned there and the next American representative would not move back in until late 1947. 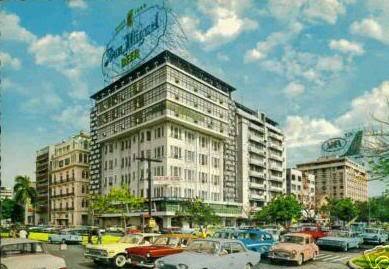 Just about opposite of where the Gaiety Theater used to be was a beautiful large residence called Plaza Militar. It’s gone now, filled with large buildings, shops and restaurants but before the war, this was a large tract of land leased to the U.S. military as a residence of the Department Commander, U.S. Army. It was used as the residence of the Commanding General of the Philippine Department and the members of the General Staff of the U.S. Army. It was formerly the headquarters of the Spanish Army staff , a sandy stretch containing the parade grounds and homes of the presiding Spanish oficiales. The later transformation to what evolved to attractive homes and beautifully kept lawns and shrubbery during the American occupation was quite a great contrast. 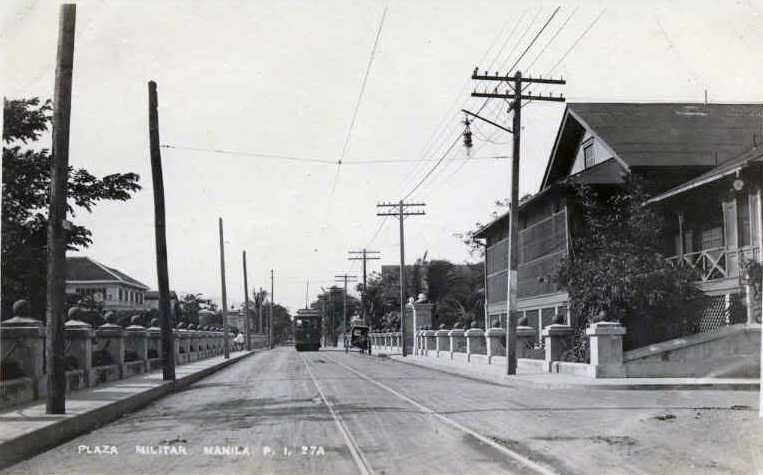 In the picture above, you can see trolley tracks along M. H. del Pilar and an oncoming streetcar trundling beside a calesa. The tranvia operated from downtown to the Luneta and southwards to M.H. del Pilar, crossing Remedios Street and the Remedios Church. The fares were five centavos for first class and three centavos for ordinary class. Located on Dewey between San Andres (Quirino Ave.) and Vito Cruz (P.Ocampo) stands a mute sentinel overlooking the bay – divested of all the color and glory that it once was arrayed in the past. It was at this point that much of the attack in the city was concerted by both naval and land forces in the battle of August 13th, 1898, which led to the American occupation. It was built in 1854 to defend the rear approach to the city. The British had earlier occupied it during their attack of Manila in 1762. 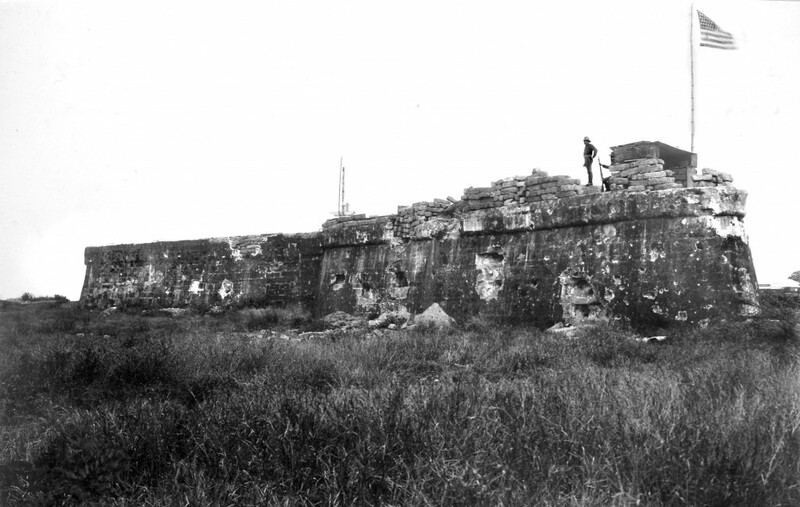 It was subsequently damaged during the Battle of Manila. The triangular fort has been restored with the construction of the new Central Bank complex and now serves as a venue for the bank and the Metropolitan Museum of Manila. Some people say that if Manila had its “golden era”, it would be during the Commonwealth period, from 1935 to 1941. Albeit a short span, it was a light-hearted time of change from the old Spanish era to the more modern American mode of infectious, high spirits where lavish entertainment, great balls, and constant partying prevailed among the elite. 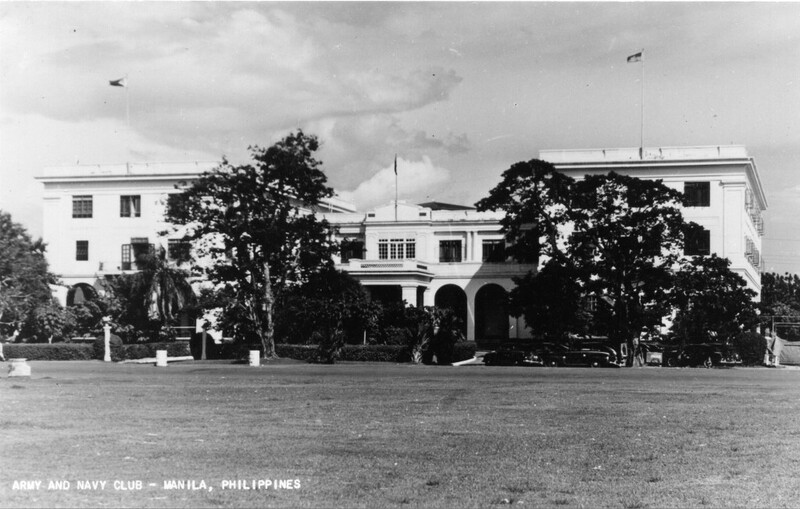 Both wealthy Americans and Filipinos used the Manila Hotel’s grand facilities that were tailor-made for these functions. 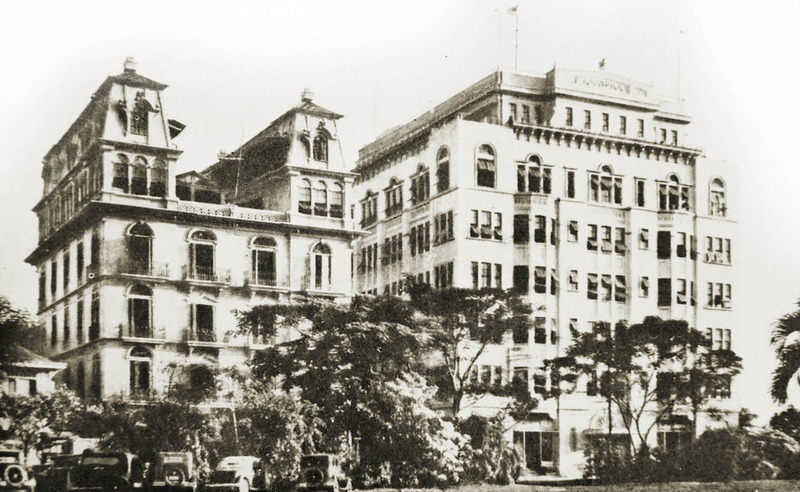 Due to its significant history in the development of Manila during the American period and after the war, I will be devoting an entire post with details of the Manila Hotel at a later time. We’re on Facebook ! Click to access the Manila Nostalgia Facebook page. The pictures and narrative are absolutely amazing. I used to live in the University Belt and would walk all over Manila, particularly Rizal Ave., and Escolta. You have brought back the Manila I used to enjoy. Thank you very much for such and excellent presentation. I look forward to more. I echo Ramon Zaldarriaga’s remarks. Since I left Manila in the mid 60s (though returned to visit many times later) the picture in my mind of the Manila I loved and grew up in were just memories…this retrospect of a city that made me who I am, is especially poignant today, my birthday. Thank you Lou for bringing me back home! PS. My dad was Hal Bowie! For the benefit of our readers, Lea’s father Hal was a radio and TV pioneer in Manila Philippines that some of you may remember. 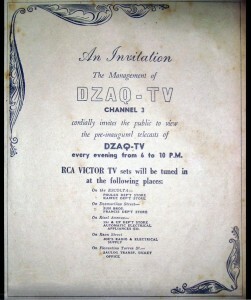 In 1939, Hal Bowie inaugurated DZRH by signing the radio station on the air for the first time. He also had a weekly show for kids that featured games and showed old cowboy movies. He was known as “Cowboy Hal.” The Bowie family was interned at Santo Tomas and Los Baños internment camps. Lea was born in camp. After he passed away in 1974, Hal Bowie was posthumously given a special award for his long service in radio and television in the Philippines. Thanks so much for writing Lea. I’m pleased the article brought back some good memories of Manila. Happy Birthday ! Thanks Lou for this very interesting presentation. BTW, my father was also in Santo Tomas. I miss the Manila we knew. Would that be Kenneth Harmon, occupation Clerk – he would have been 27 in 1944, billeted in Shanty SA-D-6 on the grounds of Santo Tomas. Gosh! where did you get that? I worked in Station DZMB for about five years and it was my pleasure to have your Dad Hal Bowie as our station manager. He was a very versatile man, not only as manager but also a newsreader, sportscaster and emcee. Specially the latter when he was “Professor Quiz,” a sponsored quiz show we did by remote at the Lyric Theater, Escolta. BTW, I have a picture of you with your Mom and Dad at Los Banos Camp flanked by paratroops of the unit that stormed the camp. Your Dad was happily showing you off to the GIs. If you don’t have this pic let me know and I’ll send it to you! Lea, I remember your dad. Your dad (family) was very close to my parents (family) Does Di’Mark’s sound familiar to you ? I am Kandy, the youngest of the 7 kids. 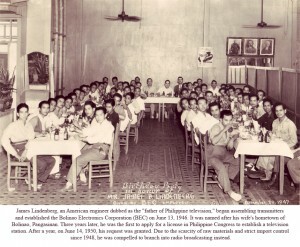 My parents introduced pizza to the Philippines in 1957. Small world. Lou, I love your blog:) I ave such fond memories of Army Navy, as do a lot of people I grew up with. It was our special place. I will share this with them. Thank you. Thanks again, Lou for all the write-up and pixes. I can easily relate to the Manila Hilton. My sister was asked to join a kiddie fashion show back then by a niece of the late Ms. Conchita Sunico. Ms. Sunico was in charge of fashion show lunches for the hotel back then. I can remember that the chef made so many ginger bread houses in varying sizes to be held as an exhibit at the lobby. I also read that Manila Hilton was built on a lot for a former protestant Church of St. John. The Red cross Building along Isaac Peral was a bonus for me. Read so much stories about it during the battle of Manila. How so many died at the wake of the battle. Doctors and nurses died at the height of their helping the fleeing victims of war. One victim had so much wounds, it was a miracle she survived it. She was a former golden star of the Philippine movies who was trapped during the devastation of the city. Will wait for the churches and schools. Thanks again. I am very curious of the Legaspi Garden? Was it near the Manila Hotel? A funny memory with the ABS building. My grandmother had two spinster sisters who were great fans of a local star. They were so much a fan that they went to that building to attend a local radio show with us in tow (my sister, cousin and I, still toddlers during that time). The host found the three of us so cute that we became part of the show and made to sing. Sweet memories! Irony of ironies, the building became the head office of the bank my dad worked for during the Marcos years. It was quite close next to Pier 7 on 25th Street. Hi Lito! Regarding the lot on which the Manila Hilton was built and purchased from the “protestant Church of St John”, that must have been the site of the Episcopalian Church, the Cathedral of St John (now located just across St Luke’s Hospital at Quezon City). I was told that there was an Episcopalian Church in that area (TM Kalaw, formerly Calle San Luis, and Florida, now Ma. Orosa) but I just couldn’t pinpoint the site. I think the parsonage (an old all wooden structure that whose design was so typically Ermita-Malate: wide windows with screens) was along San Luis and eventually became an adjunct of the Central Methodist Church probably when St John’s transferred to Quezon City. Thanks for the reference. My interest is urban history and information like the one you supplied is of immense value especially when trying to figure out a city’s old landmarks. Like I said in my comments on the first article, we must have been neighbors in Malate. I lived in the corner of Tennessee and Mabini Sts. from 1953 to 1981. If you lived there between those years, then we were very close neighbors. Those were wonderful days in a great neighborhood and the nicest place to grow up in. We were close to the boulevard, the schools with all the pretty girls, (Assumption, St. Paul’s, Phil. Women’s Univ., Malate Catholic Sch., etc. ), the moviehouses,(Gaiety, Paris, etc. ), and of course, the red light district (although that was appreciated only in the latter days!). I miss the place, which of course, has today changed drastically. I can hardly recognize it any longer during the few times I pass by. One truly, can never go home again. My maternal Grandfather’s (Juan Riu y Planas) family lived in Indiana street before the war. 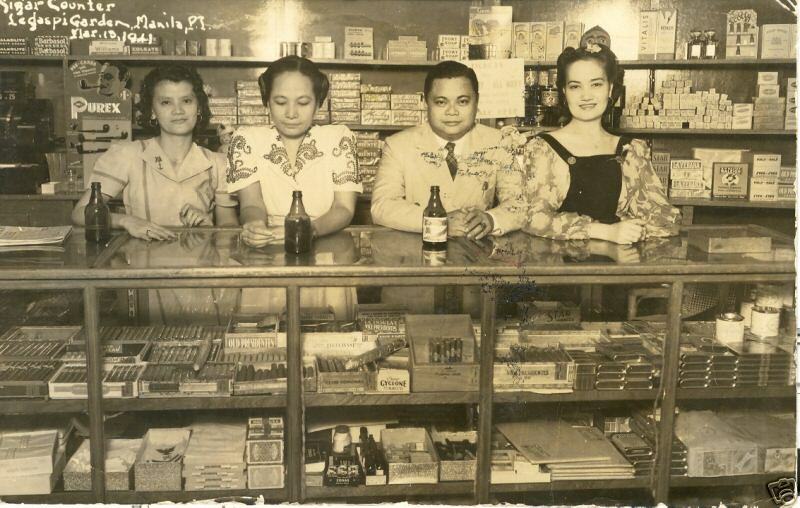 His store (Riu Hermanos, established in 1928) was in Escolta and the cashier was my mother (Conchita, now 91). When the battle of Manila took place in 1944, my Grandmother (Felisa delos santos Cruz from Montalban) and her son, (Joaquin, 17, Lasalle student) were killed by an artillery shell. My mother, together w/ her Father, evacuated the area, carrying her 6 year old sister (Lourdes Riu-Andrews, mother of Bobby). Our family transferred to Quezon City after the war. In the early 60s, as a toddler, I too had the chance of going the only movie house in Ermita when the movie houses in Rizal avenue had no more parking spaces. We also went to the Acme supermarket, Casino Español, and the night paseos along Dewey blvd. riding the double decked bus. 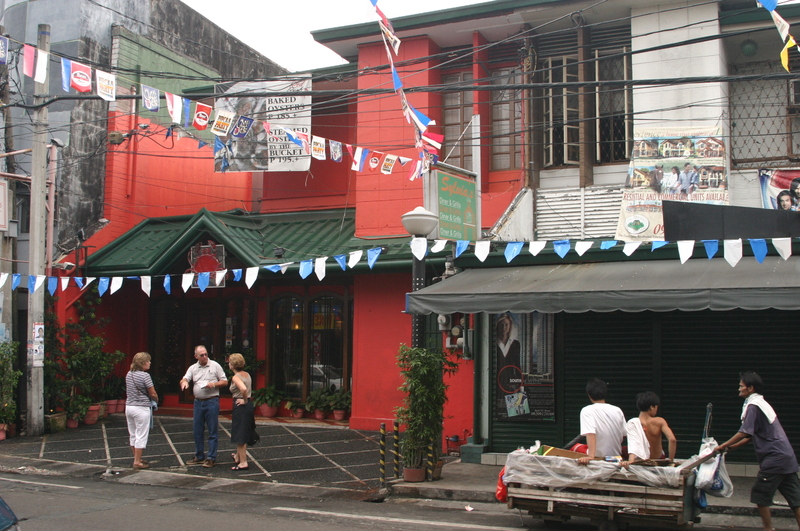 The streets in Malate were named after the unit/state of the United States Volunteer Army during their war against Spain and the Philippines. Enjoyed reading all the stories. Lou, you just granted my long-standing unexpressed wish to see two pictures I couldn’t find on the net: 1) The pre-war Red Cross office which I realize just now was right smack on that Isaac Peral and Gen. Luna corner. I have read much about the horrible stories there during Liberation; and 2) The old ABS studios on Roxas Boulevard, Pasay near the Baclaran boundary where I grew up as a kid getting tagged along by spinster aunts who watched the Channel 2 tv shows live until I was old enough to go on my own when KBS Channel 9 took over the facilities. Precious memories revived, many thanks again to you. Your Ermita District Part 2 brought back nostalgic memories to me. When studying preparatory law (Pre-law) in the 1950’s at Adamson University located at San Marcelino Street, I was boarding at the apartment of my auntie in Enriquez street, Paco, Manila. My cousins were students of PWU or Philippine Women’s University, so Dakota and Remedios streets you mentioned were familiar to me. When I studied law at the Lyceum of the Philippines, I used to walk towards Taft Avenue to get my ride in going to said law school. Your narrative and pictorials make the study of the history of Manila interesting and remind the readers the golden years of “Maynila’s” districts of Malate, Ermita and of course Dewey Boulevard now called Roxas Blvd. Homesick again! It happens every time!! A beautiful city and beautiful people!!!! Great photos of what was once the great Manila! I’ve shared these with my 2 grandsons and they enjoyed the uncluttered face of our city. Thank you! NOSTALGIA !!! Brought back great memories of my growing up in Sampaloc and my student days in UST ! As they say … THOSE WERE THE DAYS MY FRIEND. Yes, indeed beautiful city and beautiful people. Roxas Blvd. was our destination for a great time. Yes, I remember reading about Ted Lewin. Thanks for naming that casino. I wasn’t able to recall the name. Another mystery solved ! I’ll never forget my dad, Red, and a few of his buddies getting ‘arrested’ at the casino. 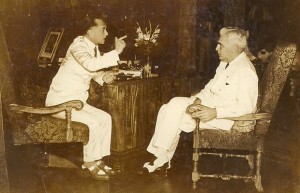 JOSE DIOKNO Y WRIGHT WAS THE JUSTICE SECRETARY. HIS BROTHER, ANTONIO DIOKNO Y WRIGHT HAS A SON, RAMON DIOKNO Y TEODORO. Lou, thanks to you I have seen pictures o Manila that I have never seen before! Not only that but I also learned things about Manila that I never knew before. Thank you!!! Another winner, Lou! I really like the way the photographs enlarge when you click on them…..Can’t wait for your next issue……….! More and more people are reading your excellent blog, and telling me about it, etc. I think it’s great, Lou, and its made me even more home-sick to visit my old neighborhood again. I used to live in Leveriza before/during the Liberation, then Sta Mesa and Tanduay post-war. As you know, went to La Salle through High School, left for the States in 1958. Still have a lot of memories and photos of pre-war days, and visiting my aunts who also lived in Malate, Remedios Street and vicinity. Are you and Flor Manila residents now? I lived in Kalaw Court off Remedios Street during the Occupation from 1942-1945. Behind us, on Florida Street lived the family of Teresita Crame. We ran around in the same teenaged crowd. Can you bring me up-to-date on this Crame family by using my email at zogmar@comcast.net. I fondly remember Lou’s nostalgic trip to the Remedios Circle, the Gaiety theater and evening snacks at the Aristocrat Restaurant off Dewey Blvd. I enjoyed reading your posts. They bring back memories of yesteryears. My yaya and our driver used to take me and my siblings to Manila Bay where we waded in then clean and clear water. I learned a lot reading your articles. Thank you for sharing all these and I look forward to reading more of your future posts. 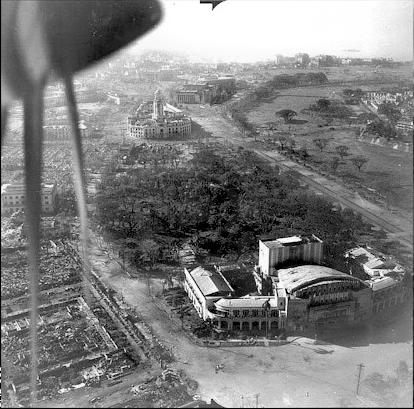 Ermita was almost thoroughly destroyed during the battle of Manila which waged from Feb. 3 to March 3, 1945. The post-war Ermita has hardly any resemblance to the Ermita we, who lived there before the war, knew. 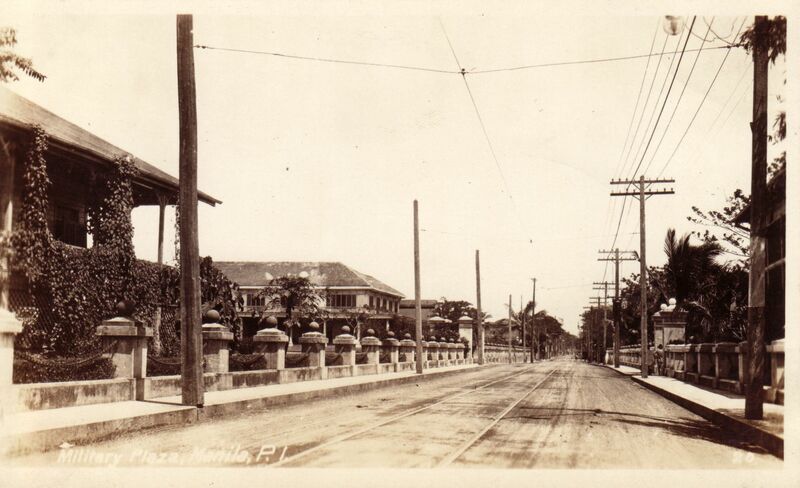 Calle Isaac Peral, which has now been renamed U. N. Avenue, was about the most beautiful street in all of Manila. It has broad sidewalks and acacia trees on both sides whose over-reaching branches formed a canopy from Taft Avenue all the way to Dewey Blvd. (Roxas Blvd. now). Every afternoon, water trucks would water the streets of Ermita to insure that it was clear of dust and debris. Ermita had broad sidewalks which have now disappeared. Most of the houses in Ermita were homes built in a style no longer seen now. The Spanish influence in this district was still very distinct. Many houses would have signs that read “Cuidado Por los Perros.” Doctors would be described in their shingles as “Medico – Cirujano.” Ermita was not rebuilt after the war. It was allowed to become a district known for its honky-tonk bars and decrepit stores and salons. James Litton has worked tirelessly for the erection of monuments to the memory of the WWII heroes. He is a lawyer and a hardworking member of the “Battling Bastards of Bataan” as well as the author of the book, “Battle of Manila Survivor”. Thank you for sharing your memories, Mr. Litton. Is there a way I could purchase your book ‘Battle of Manila Survivor’? I’m not into online buying so I could not purchase through Amazon. These books relating to pre-war Manila are very rarely found in commercial book stores. I’ve read Carmen Guerrero Nakpil’s ‘Myself, Elsewhere’, a book about her life in Ermita during pre-war. She was born in the 1920’s, a time when Manila was at its best. WOW, amazing of what you impart to us , very informative and precised THANK YOU so much. Looking forward to your next information about the place where I was born 54 years ago. It is really great to go back in time where life is so easy and simple then and uncomplicated as compare today. God Bless MANILA!!!!! Carlos Quirino was a former classmate. He was a member of the De La Salle Band and played the clarinet. Lou, if you have or make this into a book, we will sell it in our gift shop for our tourist & local guest. It would make a great coffee table reading. I wish we (government & business & residential community) could have a concerted effort to bring back some of the beauty of what once was. If I make it into a book, you’ll be the first one I’ll contact. Thank you for your kindness. I hope people will finally realize what they are losing permanently before its too late. What a nice trip down memory lane, Lou. Even though I grew up in San Juan, still we visited my paternal grandparents in Ermita and took in all those of the area. You left out 2 of my other favorite haunts of the area that are mere ghosts now as well: Country Bake Shop and the Tasa de Oro coffee shop. As Guerrero said, you can never go home again. Myles, please read Malate – Ermita Part 1 I cover the Taza de Oro in that one. I loved the hamburgers at Country Bakeshop. I remember it was along Padre Faura a few steps away from Acme Supermarket (on the right-hand side) when you are walking towards Dewey Blvd. Does anybody remember the Brown Derby and Fairmont Ice Cream along Taft Avenue in front of PGH? Where exactly were the geographical boundaries of the “Ermita” district? Also, I’d like to augment your treasure trove of memories with a couple of my own. 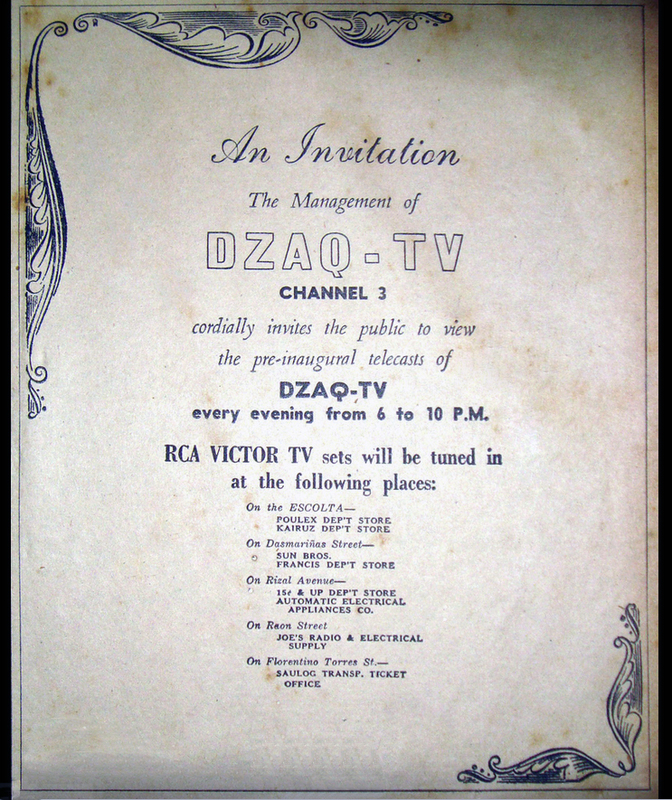 DZAQ TV, Channel 3, first broadcasted from the 4th floor of the Republic Supermarket Building on Avenida Rizal. I do not recall whether the Avenue Theatre was a part of that complex. The earliest on-air personalities were “Uncle” Vero Perfecto and Tita Munoz. I was fortunate to be a regular in a program fashioned after the U.S. “The Mickey Club”. In the P.I. (as the country was known then), it was “Uncle Vero’s T.V. Show”. Instead of M-I-C-K-E-Y, etc… theme song, “Hail, Hail the gang’s all here…etc…” was adapted. Re: Hilton….Managed by a dear boyhood friend of mine Roberto “Robbie” Delgado. Also, Dioscoro “Boy” Palacio, was regularly featured at 1571. I did not meet him then but he is, at 78, the musical director of my band, “Latitude”. He is a piano virtuoso and is the undisputed Dean of Filipino musicians in the Bay Area. Also a very good friend and favorite accompanist of Pilita Corrales. Finally, “Boy” is a veritable fountain of very interesting stories during those/them days. Finally, Bobby Ng also recruited “The Strads” to perform in his TV show. Two of the members of that group, Salvador Vaca and Bert Silos later became “The Everly Brothers” of the P.I. Bert is now one of the front acts for Latitude. I’m not certain but I believe Malate runs from Herran to Vito Cruz and over to Taft while Ermita goes northward to the Pasig. I remember the Strads well – they were a great band. Does your band Latitude have any recording links on the web ? I’d love to hear your songs. Thanks for sharing your memories ! I’m gladly sharing these links in determining current district boundaries of Metro Manila. Hope these help in reference to your query. Thanks for the maps and the effort of providing the discernible boundaries of the Malate and Ermita districts, respectively. You have scratched and “itch” I’ve had the better part of 50 years. Hello Frank, I hope this helps. Ermita starts at San Luis (TM Kalaw) and ends at Herran (Pedro Gil) south bound. Malate covers Herran St. to Vito Cruz. Wow! I used to watch Uncle Vero’s Kiddie Show every Saturday afternoon at Republic Supermarket Bldg. along Avenida Rizal. It housed the Republic Theater and next door was Avenue Theater. The only TV channel then was Channel 3 and we looked forward to watching Western Theater on Saturday early evenings. 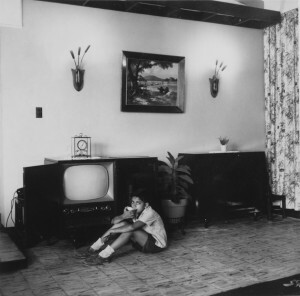 Everything you saw on TV was in glorious black-and-white.The TV commercials then were just slides and no animation. Too bad, Channel 3 would sign off at 9:00 p.m.
Lou, I enjoyed reading the Nostalgia of Ermita – Malate area. Although my family has always lived in San Juan…..we used to go to Malate Church every Sunday and that’s where we always went to mass. 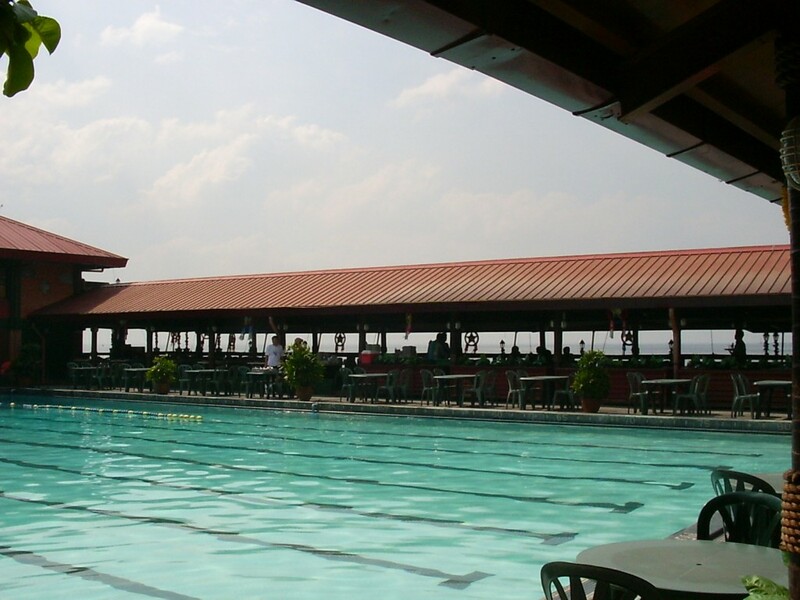 After mass we would go for lunch at one of the restaurants and sometimes go to the Army Navy Club to swim. Seeing those enlarged photos was like getting back to my childhood memories with my parents & siblings…..I love your stories and I agree….this must turn into a book. Happy Sunday from Canada!! Precious, precious history and personal insights once again! Thanks for bringing this old area back to life. My lola lived in a beautiful home in Malate and I have fond memories of that area. Thanks again. Thank you very much for sharing these wonderful photos and memories! You have awakened the past and brought back history in our lives. I will tell my friends about your great blog! More power to you and your family! Wished i lived during those grande times..Thank You Mr. Pal for sharing your knowledge..I only hear from Grandparents about Ermita and environs. My father used to work for PAL ticket office at the S & L bldg…Those were only times I saw Ermita, Senator Osmena had an office in that bldg..Thanks again. To Mr. Mabutay, the PAL Ticket Office was at L&S Bldg. close to Selecta Restaurant. I love these trips down memory lane, Lou. Great job and even greater pictures. Ricky Catala is a name I have not heard in ages. We used to hang around quite a bit in Madrid in the late 60s along with his brother Juan Miguel. The sad part of all this is, if you were to make a movie of Manila life between 1930 and 1970, you wouldn’t be able to film it because all those landmarks are gone. This BLOG is really a gem !!! Not sure if you remember me. I live in San Diego now and I recognized the names of a few people, like Skip Haven, a wild and crazy guy and Ronnie Davis was my classmate. I lived in that area near St. Paul which I attended in my kindergarden years I don’t remember much. But I remember you were in our Vampires picture. Hi Lito, were you a La Sallite? I see Ronald Davies here in Daly City, CA once in a while. He was ahead of me in high school. He has gained a lot of weight but walks with a limp. I see him sometimes at a local supermarket which is just a block from my home. I’m not sure if he is still in the real estate business. Hey Lito, I remember you from De La Salle Taft. Ronnie Davis is now a realtor here in San Francisco, CA and last time I saw him he was walking with a cane. He was the only “American” boy who could speak Tagalog. Was Ronnie a PNT sarge? I remember our High School uniform with the PNT patch on the shirt sleeve and I would insert A and O in-between the letters PNT to mean “panot” for Mr. Lara our PNT commandant. LOL! Lou what wonderful compilation of info and pictures. 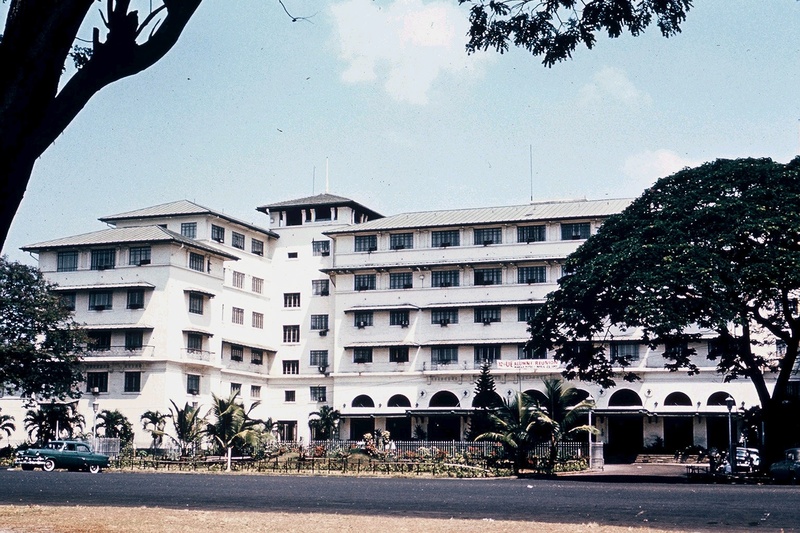 Some brought back memories of 1955 when I arrived in Manila with my parents as we stayed at the Luneta Hotel for a few weeks before moving to a house in Quezon City. I used to look out the window facing Luneta Park and count all the yellow taxi cabs that went by. Manila was such a beautiful city back in the days. It would not be a coincidence that your surname happens to be the same surname that belonged to the owners/operators of Yellow Taxi and MY Taxi, Companies, would it? Hi Frank, no – my family has no connection to the taxi companies. Yellow Taxi was owned by the Monserrats. I still remember another La Sallite, Philip Monserrat. The area around Malate and Ermita was part of the neighborhood that I knew from my post war school days at La Salle College. But in October 1944, I remember walking from school after being picked up by my two brothers (they were released from St. Scholastica) still in tears because I was the last one to leave Juan Medrano’s kindergarten class held under the chapel. We walked to PGH close to the house of Dr. Abriol and Maryknoll on Pennsylvania. We lived in Sta. Mesa. Our family sent out the calesa immediately to pick us up, past several “zonas” at San Marcelino, Ayala Bridge, Aviles and Sta. Mesa Boulevard. 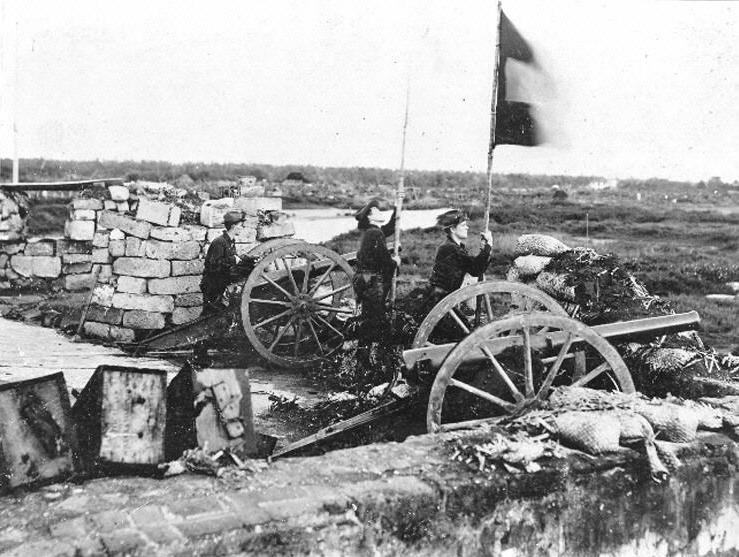 Much later after liberation, we crossed pontoon bridges to visit the south. All of the structures from Taft to the waters of Manila Bay were leveled. And La Salle was unbelievably pock marked with shells and bullet holes and burned walls. Your work is so precious, I still cannot choke back tears for the pearl of the Orient. Are you familiar with the massacre of 16 (of 17) Christian Brothers of DLS, one of the most heinous crimes committed during the battle of Manila in February, 1945? Was this an incident that you may have been aware of almost in real time back in the day? Yes, in doing my research for both my Santo Tomas Internment Camp documentary and these articles, I read about the massacres and tragedies that occurred during the Battle of Manila. My parents were living in Malate at the time and luckily survived. I was born right after the battle, in April 1945. Class Picture: De La Salle High School 1964). He always wore white. Remembering Mr. Medrano, If you wrote JMJ on the upper right hand corner of your test paper, you would get an extra 10 points from him. Your article and photos brings back a lot of memories of my college days in De La Salle College, Taft Ave. from 1962 t0 1967. Too bad that most of the landmarks are gone forever. Malate and Ermita are almost unrecognizable and every structure looks so dilapidated. What a pity!! Mr. Gopal: Thank you for a wonderful walk down memory lane. My family lived in Gral. Luna and Padre Faura, both very close to Paco Park. I have nothing but fond, fond memories of growing up in that area and, even though Manila’s changed dramatically over the years, she will always be home to me. Can’t wait for your next segment. More power to you and your blog. Madam, are you related to Jose Luis Garriz? I remember him as my cousin’s former classmate at La Salle grade school. Mai (Maitos) Garriz is my first cousin. Her father (“Tito Pete”) is my mother´s eldest brother (my mom was Pilar – aka Piluca – Garriz, married to Jesús – aka Jess – Oria). Yes, she has a brother by the name of José Luis (Josel) but I don´t know if he´s the one you´re referring to. Are you related to my classmate at the American School, Gammy Garriz ? I will save these blogs so I can go back every now and then. I love the pictures of St. Paul’s – that’s were I met Lea! Thanks for taking me down memory lane. We lived in Ermita for some time (can’t remember the address) because my mom owned a coctail lounge, The Black Sheep, just around the corner from the Filipinas Hotel. I remember the Captain of the Police Precinct was James Barber. Life was good! In the late fifties-early sixties we lived in a house on Dewey (Roxas) Blvd facing the bay, just a half block past Selecta. Every so often we’d cross the boulevard, jump over the seawall and take a dip in Manila Bay. I still remember seeing fish through the crystal clear water. Growing up in Ermita/Malate, we watched many, many movies at Gaiety- I’m wondering if anyone remembers Martin’s- the place across the theatre that served raisin bread.. toasted and buttered and served with arroz caldo or palabok. Another favorite were the early morning runs to Ferinos for steaming hot bibingka which in those days was back port area rotunda somewhere.. In the early seventies we moved to a house on Dakota a block from Remedios circle- we were there when Cafe Adriatico started, and all through the days when Remedios Circle was the happening place to be (my brother helped Larry with the Cafe Havana idea)..
Hi Rich, you still remember Martin’s. We used to go there for hamburgers. Their burgers on rye were much different and much bigger than the hamburgers at Country Bakeshop. Martins was just across from Gaiety Theater. Am so lucky to have been born after the war and experience the beauty of Old Manila. I wish I had a Time Machine to bring back the Good Old Days! Thanks Lou for all the photos you shared with us all! Thank you so much for this precious piece. I was born in a clinic on Herran St. in 1952. In 1959, we moved into a compound on Dewey Blvd., the corner house (beside Selecta, corner Romero Salas St.). This is where the happiest times of my childhood were spent-playing in the wide open spaces & lots along Dewey & Cuarteles St., crossing the street for the occasional dip in the crystal-clear waters of Manila Bay, watching cartoon movies at the Gaiety Theatre around the block, enjoying the freshly baked bread from Martin’s Bakery, mongo rolls from Sombrero Bakery on Mabini, macapuno & mantecado ice cream from Selecta, and on and on. In 1971, we moved to Adriatico St. (near Vermont) and while our family stayed on in Malate, I headed for the US. I am presently visiting my parents who still live in Malate, and I am looking around here in the present-day, waxing nostalgic for the halcyon days of my youth, heaving a big sigh. Thank you. That clinic on Herran was Clinica dela Rosa. We lived on San Marcelino St. between Herran and California (Josefa Llanes Escoda) very close to the first Rustan’s and the famous Bungalow Restaurant. Dear Lou, Reading these articles written by you, makes feel at home again in my younger days. I remembered some of the places but not the pre-war era. When I was young, I walked a lot in Dewey BLVD. as my teacher called it ” Boulevard of Broken Dreams”. I walked going to Baclaran church, seeing all those beautiful scenery, the Sun set and the mighty ships of the American seven Fleet. My mom used to take me to Baclaran church to attend the Novena and after the services she would buy some letchon from the Vendors nearby the church, to take home for our dinner. ( ang sarap those letchon) LOL. Leaving in Florida, have some similarity to the Philippines, We had some Hurricanes(Typhoon) and plenty of tropical fruits. My last visit in the Philippines was 1970 but had lots of memories of the past (some are goods and some are Bad) . When I left in 1962 to the USA, the popular show, I watched at noon time was “Student Canteen”with Leila Benetez, Si calvo, I forgot his name and Eddie Ilarde. directed by Bobby Ng. Remedios then was hung around by Bacla ( Gay). LOL I walked a lot in Vito-Cruz, Singalong st. , Taft avenue. Pennsylvania st. nearby Capt. Ticong st. As you can see, I was going to Singalong Parochial school run by Spanish Capuchino priest. I played some weekend Basketball at the De la Salle college with some friends enrolled there. Thanks Lou for reminding of those old glorious days in Manila. The “calvo” would be the late Pepe Pimentel. There was another personality connected to Student Canteen and “Darigold” jamboree which followed SC. His name was Bobby Ledesma who is no longer with us. Thank you, for reminding me of Pepe Pimentel, He was a funny guy and missed those days show. salamat again. I also watched” The Parola boys, The Tionco brother and the Ricard duet and the evening show of “Tawag ng Tangalan”. The only things now I can say is “Those were the days”. Thanks for informing me for the new school name. Did you go in that school too? Proud to be Filipino. So much history in those photos. Thank you so much for sharing. Hey Ernie, great to hear from you. Don Lee still remembers you and your “mental ramblings” as well as the daily Caltex news he did over the Chronicle radio station at Aduana. As for me, I recall with great fondness those incredible Christmas light shows displayed on the Caltex office building in Padre Faura corner Pennsylvania for a whole month every Christmas season. If you’re free, I could pick you up in my Chevvy BelAire and invite you for a steak dinner at the Manila Overseas Press Club on Dewey, maybe play Liar’s Dice with the guys and then finish the evening at Taboy’s in Ermita. Cinco litros! solo otra vez, why not? Be sure to read Part 3 of Ermita-Malate now available! music venues we had and have. Would be nice to hear from you again soon. CALTEX OFFICE AT DAKOTA CORNER PADRE FAURA, FORMERLY, ATENEO DE MANILA SITE, AND, NOW, A PAL FACILITY. Thank you for the photos! It just depresses me more when i see what Manila has become! parts consolidated as one book? It will DEFINITELY be a best seller ! José Miguel Razón y Albert: Beaverton, Oregon July 24- I am overwhelmed by so many beautiful, precious photos. It would be really great if all this could be “reconstructed” and perhaps the old, familiar sights my parents, grand uncles, grand aunts uncles and aunts and grandparents knew so well could be lovingly reconstructed to enhance PhilipppineTourism to add more flavour to what Manila was and could be. I worked at the Intramuros Administration: 1985-1987 prior to coming to the U.S. and I transcribed a lot of those old Spanish documents pertaining to Intramuros: I pored over lots of old photos and texts taken from the Archives of the Indies (Archivo de las Indias) during the Spanish Régime.. I wrote in longhand from the old Spanish to modern Spanish from archival texts. These wonderful photos you brought forth are of course “extramuros” or outside the Walled City; but I am convinced that the Philippines will benefit, when the flavour, ambience of those times could be recreated and presented in a physical revival of the Manila of old, the Manila that embraced the culture of Spain, and the American experience intertwined with our own. My co workers ask me why I stand out as”Spanish” in name,. language and aspect… and I can only tell them about the polygon-shaped fortress built in 1571 and the rest is “history”. Eso es una tarea de todos los manileños. Tiene que haber todavía un sin fin de recuerdos, fotografías, recortes de periódicos, anecdotas… en muchos hogares manileños…y en el extranjero. ¿Cuantas personas conservan todavía fotos de la boda o la primera comunión de algún familiar en donde aparece un altar hoy desaparecido, o un adorno arquitectónico, o una antigua puerta…? O de alguna costumbre ya desaparecida, o de la fabricación de algún producto tradicional filipino…. A veces la gente se olvida de que Manila era una ciudad internacional, no tagala. No era tampoco una ciudad española. Era tagala, española, mexicana, malaya, china (importantísima ), japonesa….Sólo que estaba en pleno país tagalo y que los habitantes hablaban español (-incluídos los británicos, americanos, alemanes, suizos, daneses, alemanes…-) Eso es lo que trae ser el mejor puerto natural de todo el Asia. Claro que en los años veinte Manila prosperó mucho -como prosperaron muchas ciudades- todas construidas en el mismo estilo internacional de la época. Pero hay algo que hace único en el mundo a Intramuros, y es su herencia hispano-mexicana, la fuerte luz tropical (uso de las balconadas con chapiz ) y los terremotos (torres bajas, casas con planta baja de piedra y la superior de madera y otros elementos ligeros…). Olvida la cultura: el humanismo cristiano traído por la Iglesia Católica y su adaptación a la sensibilidad asiática. Toda esa herencia se puede resumir en una sola palabra filipina: delicadeza. 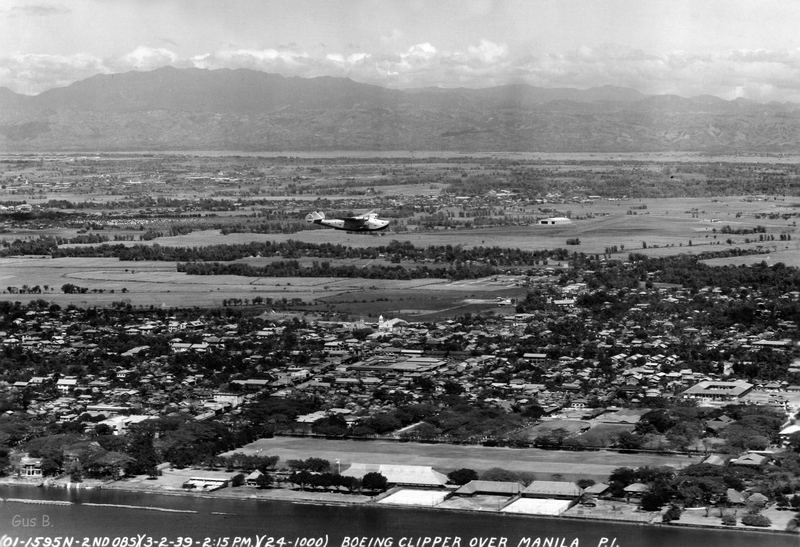 WONDERFUL stuff on what Manila used to look like….the Manila where I was born in 1956 and knew as a child up until 14 years of age (we left the Phil. in 1970, never to return again, at least not to live as a family but only for vacation). My dad – Jesús (Jess) Oria – joined the resistance movement against the Japanese when he was only 19 years old and didn´t see his family until 3 years later. They must´ve given him up for dead! My dad worked for Müller and Phipps (Chona Kasten was the wife of that company´s head honcho, Hans Kasten), eventually leaving that company to work for DANA Corporation based in Toledo, Ohio (where he now lives and will soon turn 90!). We lived in several places in Manila: Malate, then on Dungon Street, then in a compound on Balagtas Street and which – I think – was right next to the French Embassy back then?? We used to go to Patio Flamenco sports club, run by Mecca Trápaga. My dad was a member of The Executives band for many years. His close friends were Raúl Manglapus, Bobby Mañosa, Freddie Kaufmann, etc. My mother – Pilar (Pilu or Piluca) Garriz – had 1 sister (Conchita, married to an American called Irvin “Shorty” Charnock, former pilot….Tita Conchita sadly passed away last year in August) as well as 4 brothers (Pete, “Koken”, Larry and “Peachy”). The only surviving sibling is Tito Pete who lives in Mobile, Alabama with his wife, Angie. Good day! I hope this post finds you in good health. I would just like to check with you if you happen to remember or recall a filipina teen who once worked with your family in the late 60s named Mary Pigar? I’m her son and I remember her mentioning your mother and father’s name in one of her stories back in the day. She also mentioned a guy (or boy) named as Miguel and I’m not sure if he’s one your brothers. Apologies if i made a mistake and apologies to the readers if my post is not related to the blog/article. Regards and may you have great day ahead. Keep up the good work. Maraming salamat and Vaya con Dios. Thank you Ernie. All previous posts are listed on the right hand side of the article. Hello Lou, Doing all these historical work must have taken you lots of researched. I applaud you on this, but I had a simple question to ask, What profession did you accomplished aside from the American School Philippines? I guess, a lawyer, journalist or what? Give us some background of yours like most of the writer. I spent the entire morning reading all the entries on this blog. Thanks again for everything. I don’t know if you’re a drinking man, Mr. Gopal, but I would like to raise a bottle of San Miguel Pale Pilsen beer to your health. Looking through your journal, one can see how things change: fashions, streets, landscapes, architectural trends… but there are two separate photos in this particular article that show how that brown San Miguel bottle looks exactly the same all these years! Thank you Lou for sharing all these with us. I FEEL PROUD TO OUR COUNTRY! And I’m amazed that many people from other countries lived in Manila before! ^_^ Hilton Hotel! WOW! That’s awesome! MANILA is truly a vibrant city. All I can say is WOW. O.O I’m speechless. Actually, I have Google Maps with me 😀 while reading your great stories about Manila, I try to locate it on the map and fortunately, some of them are still standing.. some of them are already gone. Beautiful! I miss Manila now we live in Williamsburg, VA. You have connected more people by writing this interesting literary work. Thank you, Lou. Thank you so much for this very nostalgic piece which brought a lot of good memories to a lot of people. Looking forward to part 3. You must be complimented for what you have accomplished, Lou. You have put together a wonderful site for ex-Manilans to visit and spend some time in memory lane. The pictures are great and bring back memories for all of us. With equal diveristy; I’m sure. Its good to know how many people who grew up in Manila remember it so fondly. If you read through the names there are so many Americans, Spanish and Mestizos, Chinese Filipinos, and of course Filipinos and other nationalities that went to school in Manila; all singing the same tune of what a wonderful time they had growing up in Manila. There is no better testament than one said after experiencing something and that most ceetainly applies to Manila. I recognize many names of people who have written in which in itself is impressive because of how scattered we all are all over the world. Given that I went to La Salle all my life makes me feel more at home too since the Old Alma MAter is mentioned quite freqently. One question for Lea Bowie; did you ever have a Sarsi with egg? Your Dad always made it sound so good on TV but my mind would never allow me to try it. Great site; we all have something in common that the rest of the world knows nothing about; Good Old Manila. Please include me in your distribution list of any future posting. I would be very interested to buy your book if an when you decide to do one. I thoroughly enjoy your work, you have brought back so many memories of my youth. Though I’m not from Manila but from the fame ballad “Don’t you go oh don’t you go to far” city of the south, we do have something to share in common as I’ve worked at Escolta (PNB) & lived at Malate(Adriatico/Remedios NE cor., in the ’70s. My recollection of that decade, the bank celebrated its diamond anniversary. The Metro Opera across the river was renovated/restored to its former glory, though on a recent visit, its again closed & gathering dust. I saw Roger Moore’s James Bond movie, “The Spy who love at Me” at Lyric. Oceanic commercial is where my boss bought our wedding gift of silverware set. The Botica Boie bldg. @ Escolta/T. Pinpin. SW cor.,(now an empty/parking lot) was a Bank of PI Br. & where I kept my bank account since the tellers were more attractive looking. Historic Malate church is walking distance & so is Aristocrat w/c was 24hrs. For girls spotting one has to go to Taft & Herran, the school area. 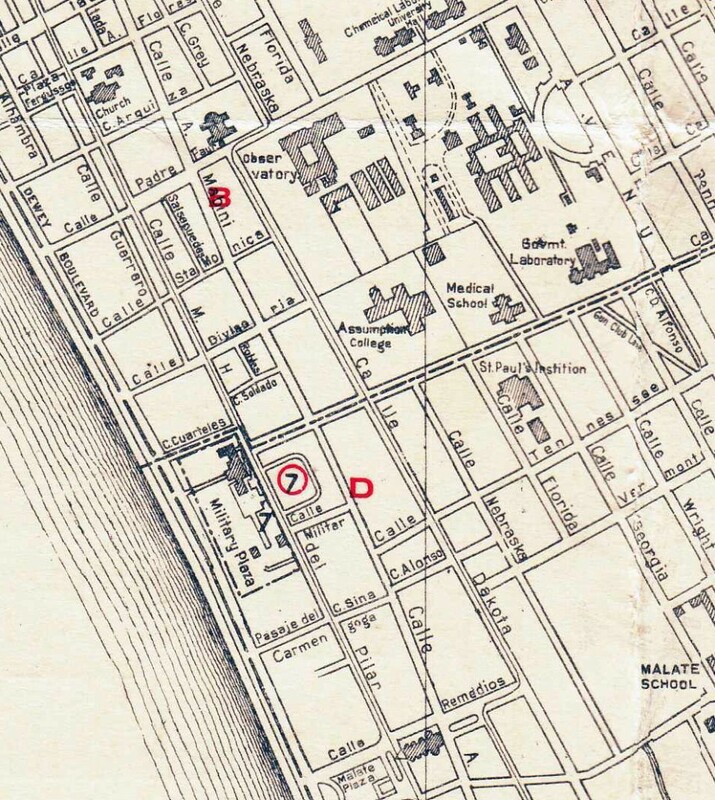 I’ve always wondered about the origin of Remedios Circle until recently I saw a Spanish era map of the 1890s indicating it was a cemetery of Malate church, circular, similar to Paco cemetery. 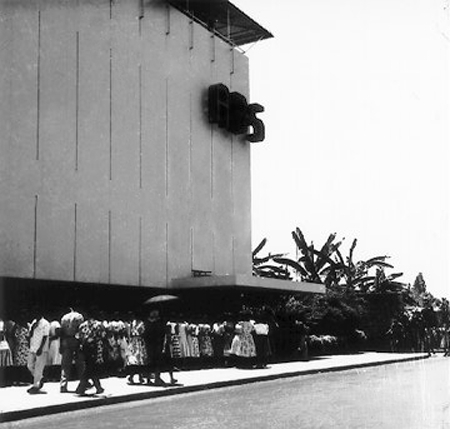 There’s one more trip down memory lane in 1966 that I’d like to reminisced Lou or any of the readers here would know on what street was the old ABS-CBN studio at Dewey Blvd./Pasay City. Thank you for sharing your excellent work. From the Long Star State, Hasta llego. We lived at 1196 M H Del Pilar. Right across from the Apostolic Delegation. When the Japanese made everyone whose place faced the bay move. Msgr Piani the papal Nuncio asked us to watch the place. My dad and I used to watch the air raids from the second floor. Once a bomb dropped in the Delegations yard and the Japanese made a big deal of it. 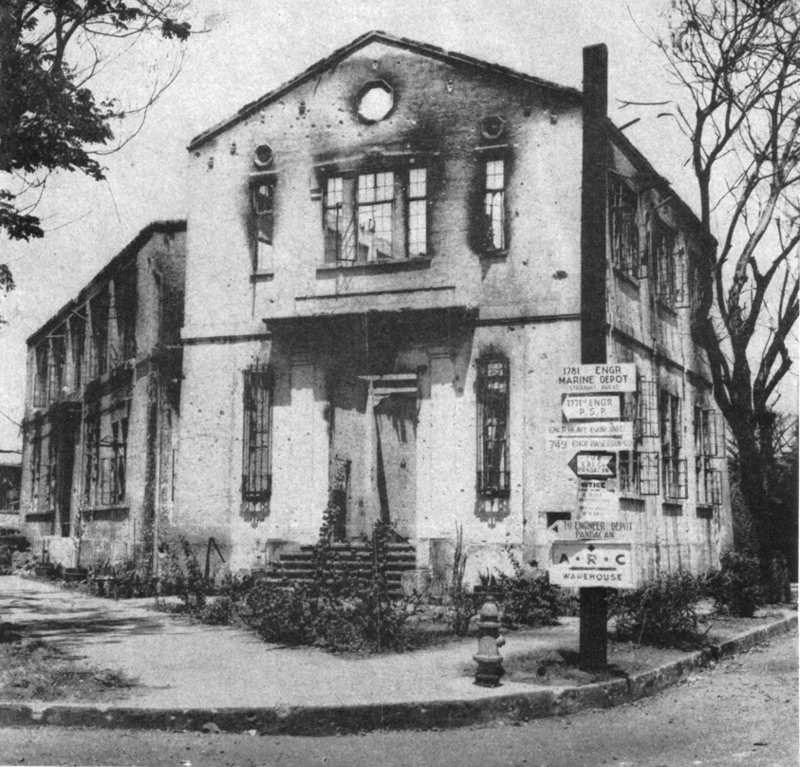 During the battle we stayed at Remedios hospital until the last two days before liberation. Good collection in photography! All of the above photographs, including post cards are among the rarest, except some pictures in the books found in few libraries. Kudos to the collector! Hi Amiel, I don’t remember the Pan Pacific Hotel around the Remedios area in the Fifties, sorry ! almost across Tau Yuan Restaurant on Malvar side. The late 1930s picture of the Bay View Hotel with the taller building to the left (or behind) that still stands today is the former Peralta Apartments, if I’m not mistaken, on Guerrero St. corner U.N. Avenue now renamed Alfonso Sycip Condominium. 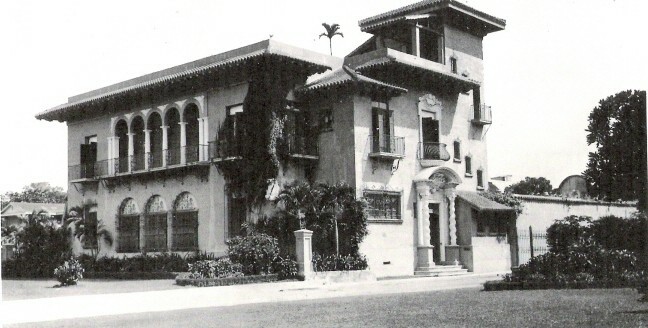 The Bel-Air, as in the previous articles, is between the then University Club (now Eton Bay Park) and the Miramar Hotel. From this angle, it could really be mistaken for the Bel-Air which I didn’t notice too until another reader friend told me. Anyway, this shot was taken from Roxas Boulevard corner or perpendicular to UN Avenue. Your write-up of Malate in the 50s to 70s? bring back memories….my family moved to Carolina St., cor. Remedios? (right behind MalateCatholicSchool were all my siblings and myself went to school–kindergarten to HighSchool) I went on to St.Paul College of Manila then went to the US. I appreciate your nostalgic article! Lou thank you for creating this site, brings back a lot of memories. I remember walking the streets of Malate when I was growing up. My dad was a machinist at Fabar Motors, a garage and dealership for British Motor Corp owned by the Barredos and Borromeos. My mom operated the canteen inside Fabar in 1964-66 then moved to the assembly plant in Pasay City where they assembled the Mini Coopers. Fabar Motors was located in the corner of Adriatico and Malvar, I was 10 then and we used to lived in Caloocan near Morning Breeze and we used to commute by bus, before my mom bought a 1952 Olsmobile, to haul the food for the staff. Your reader Amiel was wondering what was in Pan Pacific Hotel during that time, that was Fabars dealership showroom where you see the brand new Coopers, Morris, Austins, etc, Fabar used to sell Studebakers and Packards after the war. I remember me and my brother watch the cars go by and identify them by models and brand. I used to roam around the dealership and dream about owning a Cooper someday, which I did in 1972, which was a 63. I now own a 69 Cooper here in Los Angeles which I have given to my son. Back in the 60s the pelloteros would bring their coopers to Fabar for a tune before the evening game, that’s how I remember seeing them since I can’t go to Jai Alai yet. Beside Fabar was Alex Chinese Restaurant where my dad used to go before my mom operated the canteen and I love his pancit canton and miki, whatever the ingredients he puts in there it’s yummy. Across Alex was another Chinese guy , I forgot his name that sells appliances from Clark and Subic like washing machines, freezers, refrigerators etc all 110volts , he’s very popular in the area. I didn’t know that Ramon Magsaysay Building was a military fort during the war, I used to go there to visit the Asian Library operated by the US embassy. I went to UP Manila(Padre Faura )in 71 and I remember the way it used to look back then, there was Erewhon Bookstore that I used to frequent since they carry all the motoring books and magazines, UP had several colleges in Padre Faura , it was the original location before they moved to Diliman, back in the days, college of engineering, medicine, dentistry, public administration used to be there where Dept of Foreign Affairs , Supreme Court used to be. I remember that my mom would ask me to go to the International Supermarket and buy groceries and I would stop by Lord and Lady across Assumption College to Check the latest fashion and the beautiful people that goes there, of course I was checking the girls from Assumption as well. I was fortunate to be invited there for a Student Catholic Action event while in college and what a beautiful campus it was, too bad they sold it to a hotel chain. There’s too much to tell about this place and I’m glad you have made this site to bring back the childhood memories. I was involved in trying to save my Alma Mater , Jose Abad Santos High in Binondo which we lost to Megaworld and Mayor Atienza, who doesn’t care about heritage and we will lose all of these in the hands of these oligarchs. Binondo is another place I remember well spending my high school days in 1967 into the height of the student activism of the 70s, I’m hoping President Duterte will stop this trend to restore whatever is left in Manila. My great grandmother, Julieta Carpi Millán, married to Candido Pascual and later to Eduardo Gutierrez-Repide lived in a huge white house near the Malate Church. It was where the Aristocrat Restaurant is now. Might you have any pictures of that area before the war? This is the Pascual family- the siblings were: Mercedes (my grandmother); Maria; Isabel; Carmen; Jose; Ramon, Jesus. Amparito was the youngest (half sister), and daughter of Gutierrez-Repide. Might the names ring any bells? I sent a request letter from GMA Network in your email. Please let me know once you received it.